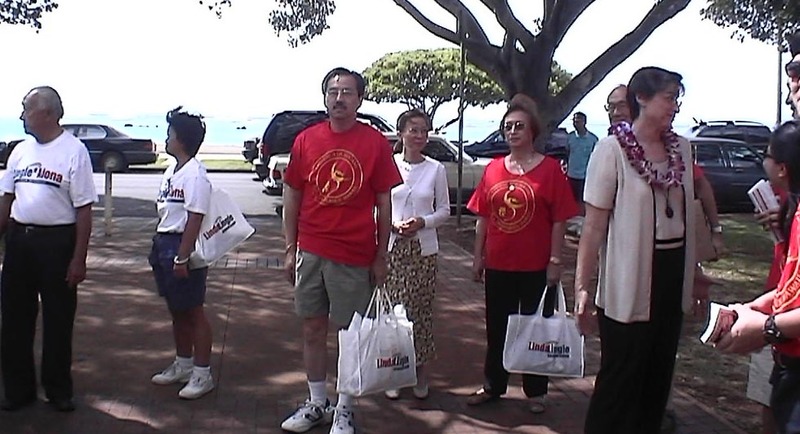 Become a member of the Hawaii Chinese Republican Coalition (HCRC), make check payable to HCRC (with your name, address and phone number) and mail it to 1188 Bishop St, Suite 3403, Honolulu, Hawaii 96813 and receive a FREE T-shirt (indicate size)! While Mr. Woo talks about the Republicans in California living under absolute Democrat Party rule because the Democrats hold 2/3 of the seats in both the Assembly and Senate, that ratio has only been in existence since the 2012 election as a result of new districts drawn to reflect the last census. In fact, because some sitting Senators won elections to Congress in the November 2012 election, and another to LA City Council later, it was only in January of this year that their empty seats were filled, and the Senate Democrats truly had 2/3rd of the Senate votes in place. But under supermajority rule, unless you are among the groups that receive preferential treatment, you are what Mr. 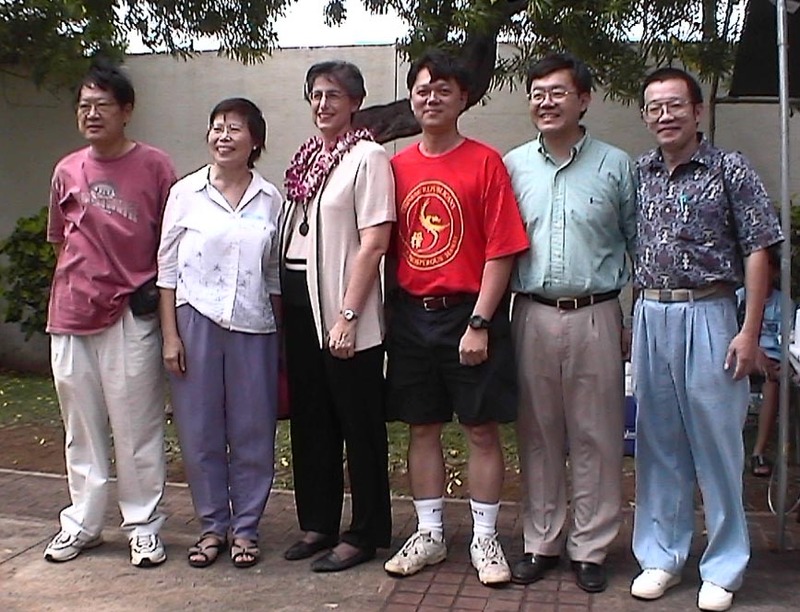 Woo describes as "non-persons." What did the Democrats do with their 2/3 supermajority in January? They passed SCA-5. 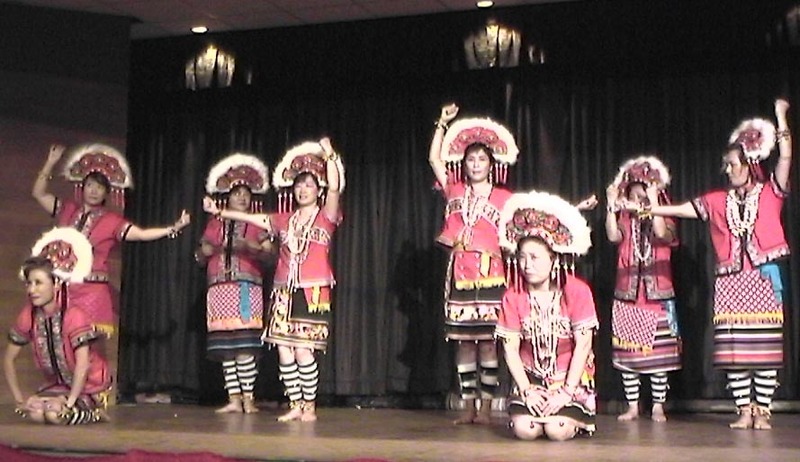 And under SCA5, Asians are non-persons. Under supermajority rule, Democrats can pass constitutional amendments like SCA-5, they can raise taxes, confirm or deny the Governor’s appointments and override the Governor's vetoes. All Republican bills were not “dead on arrival” as postulated by Mr. Woo, but the meager numbers did force Republican legislators to be smarter, re-evaluate themselves and to build alliances. How can a Party lose that badly, he asked? It was one vote at a time, one district at a time, and it was a 40-year slide. But to say that “None of them (Republicans) can be too politically astute", is not only demeaning, but misses the bigger picture of representative government. California is unlike any other state in the nation. Each Senator represents a district with 931,000 people, give or take a percentage either way. To put that in perspective, each Senate District in California contains more people than the state of Delaware. All 12 Republican senators made their case to, were elected by, and have the confidence of the majority of voters in their respective districts. This is a cumulative representation by Republicans of 12 million people—larger than most states, but still a superminority in California. Mr. Woo’s comment that Republicans were inspired by the effectiveness of the Chinese- American community in opposing SCA5 misses the point. The question should be, where was the Asian opposition the previous two times Senator Hernandez introduced the same racial preference language over the past five years? Republicans were there voting consistently against the ill-conceived measures, while the Democrats, including Asian Democrats, voted for them. SCA5 was not a creation of the Republican Party and it was also not the Republican Party that taught Senator Ted Lieu or Assemblyman Al Muratsuchi a lesson. So I fail to see how the Republican Party is to blame for diving a wedge between the Latinos/Blacks and Asians. 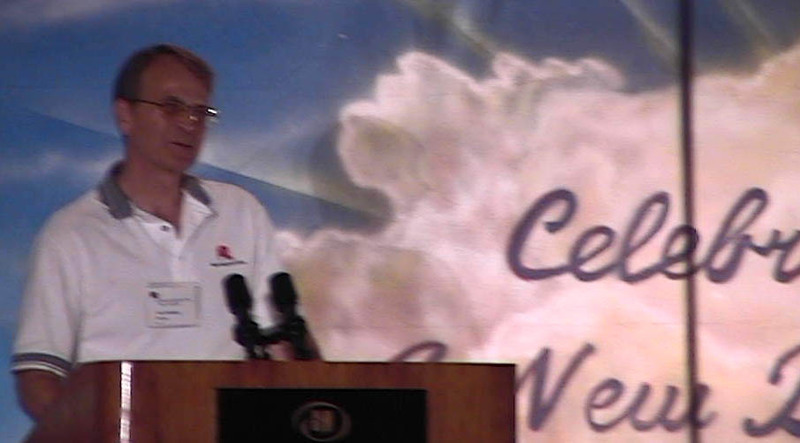 Republican opposition to SCA5 has been consistent through the years, reflecting principled lawmakers voting for their core beliefs of personal responsibility and limited government. 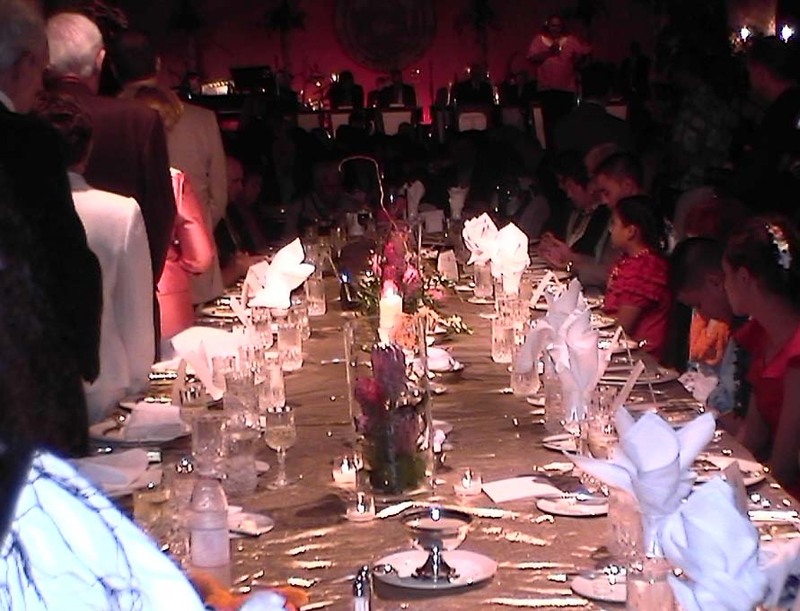 The dinner table has been set by the Democrats the same way, three different times in the past five years. This time Asians woke up and realized they were the main course. Not only was there never an effort to create or drive a wedge issue, there is not one now, and my husband and I find that offensive. 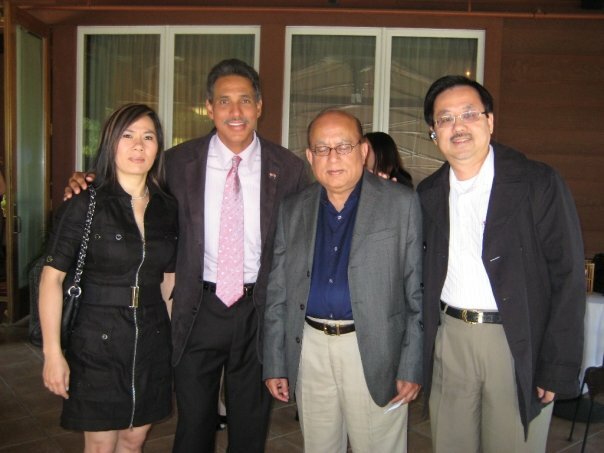 The 29th Senate District that my husband represents is comprised of 27% Asian residents, or 254,000 in round numbers. He works hard to represent all of his constituents. Even though my husband is the Senate Republican Leader, he is not the type of person looking around for wedge issues. He looks at issues in his community as well as the state, and tries to address those issues in a way that makes sense. 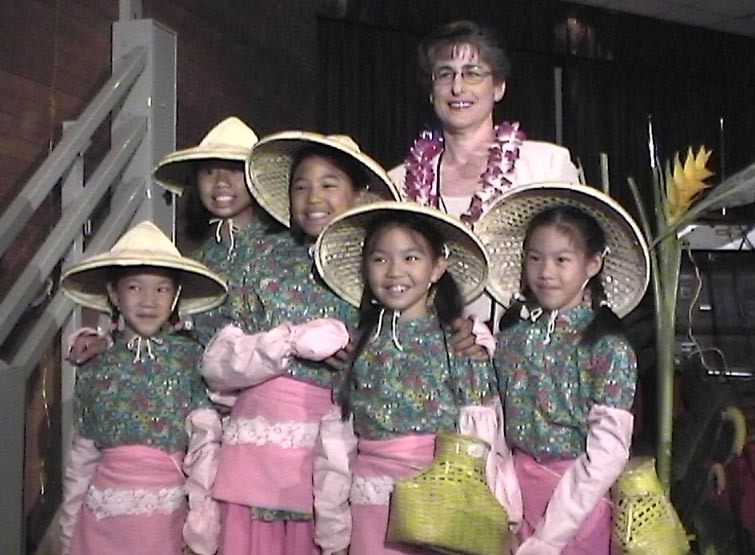 When Chinese after-school programs were being shut down by the Democrat-controlled state government as illegal childcare, Senator Huff fought the battle for about five years, but finally got legislation passed that made these after-school programs legal. When school “District of Choice” legislation was about to sunset, my husband carried successful legislation to extend the program because it gave parents more control over which schools they could enroll their children, to get a better education. Senator Hernandez (author of SCA5) fought and voted against this program because it was perceived that most students who wanted to leave a school in his district were Asian, and when Asian students left the districts they lived in for districts they preferred, they left their home school districts with lower school scores. This is likely why Senator Hernandez wrote SCA-5 to apply to all public education, and not just Colleges and Universities. As for SJR-23 related to the state apologizing for historic discrimination against the Chinese, and calling on Congress to do the same, the timing is coincidental with nothing to do with SCA-5. 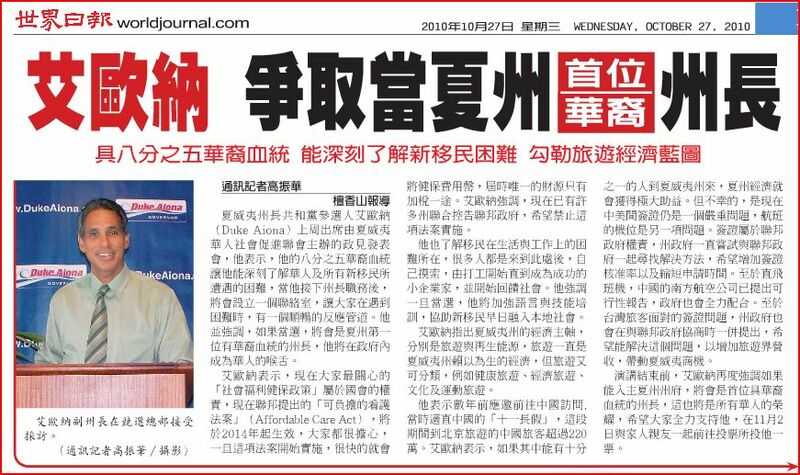 My husband had been working last fall with some Chinese who had concerns that our Federal and state governments expressed regrets about this historic discrimination against Chinese, but they haven't apologized as they have for other minorities. The bi-partisan, multi-racial LA County Board of Supervisors led the way by signing a letter asking the Federal Government for an apology. 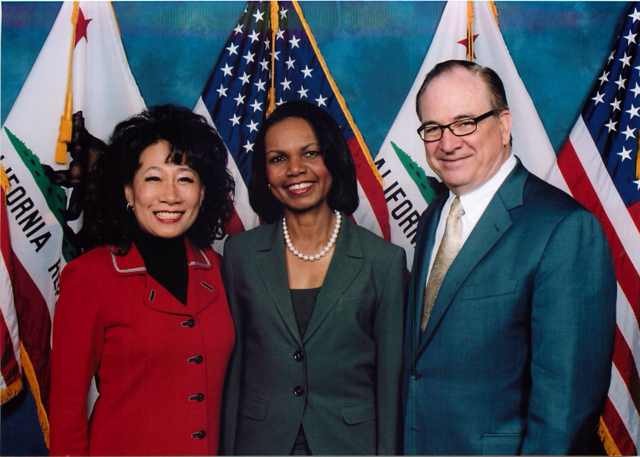 So, in January, some time before the January 30th floor vote on SCA5, Senator Huff asked Senator Leland Yee to jointly author SJR23, to show bi-partisan and bi-racial support from the state legislature seeking an apology. SJR23’s introduction was delayed for a bit because Senator Huff wanted the furor over Senator Yee’s subsequent vote for SCA-5 to die down. 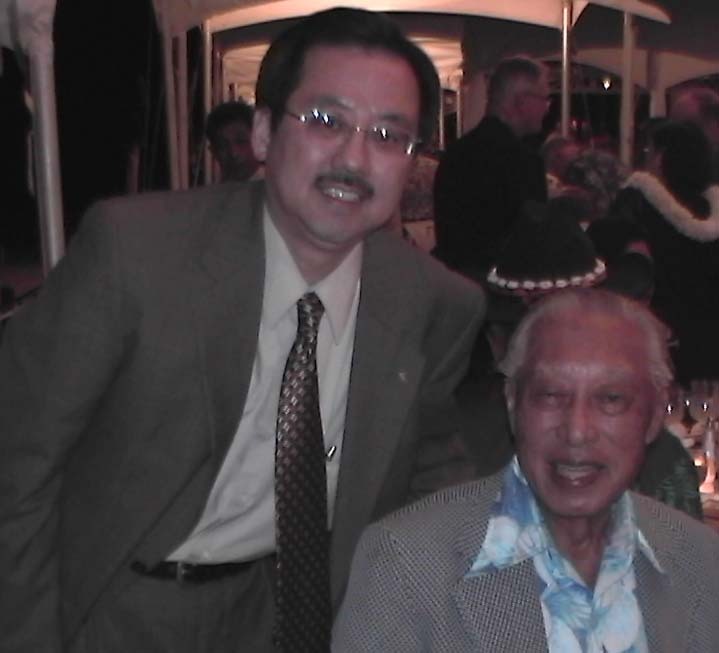 Senator Yee was then arrested in an FBI undercover operation, so Senator Yee’s name was stricken from the bill. Let’s not get too wrapped up in the thought of political gamesmanship, as the author is implying. Let me restate that there are no political games being played here. SCA-5 was bad for our community and bad for the state, and SJR-23 is good for the state to understand and express apology for past behavior. Ironically, in perspective, SCA-5 is just a 21st century version of previous and historic discriminations against the Asian community. Let's not forget that when the vote for SCA5 ran over the Republicans in the Senate, then into the block wall of Chinese/Asian grassroots opposition, that the Speaker of the Assembly sent it back to the Senate without a vote. It was then that the Latino and Black Caucuses issued a statement that they still support the principles of SCA5. 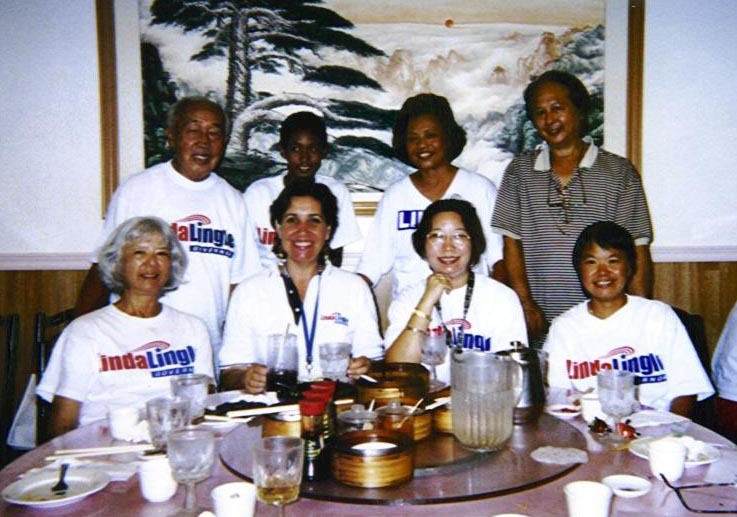 It was also the Latino and Black Caucuses who pulled their endorsement of Senator Ted Lieu for Congress as punishment for withdrawing his support of SCA-5, and then punished Muratsuchi by killing his bill on the assembly floor, after supporting it in committee. The Governor, the Speaker, The President pro Tem of the Senate, and the Latino and Black Caucuses have all reaffirmed their support of the principles framed in SCA5. Our struggle is far from over. 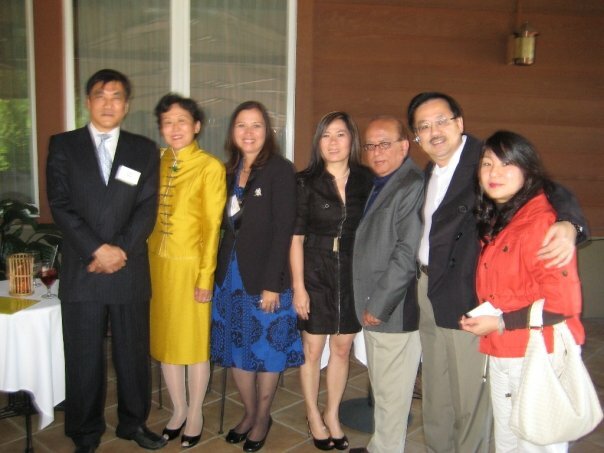 If we can't successfully beat the Democrat's super-majority in at least one of the houses in this year’s elections, we will see it come back to haunt not only Asians, but all Californians who strive for a level playing field and excellence in our educational system. 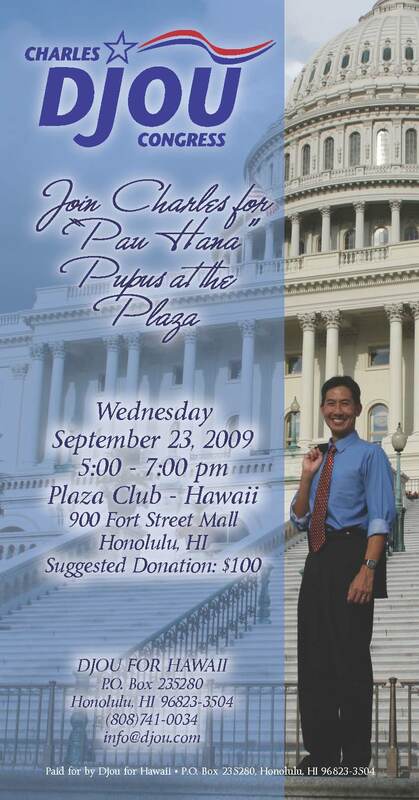 HONOLULU -- As was widely expected, Charles Djou is once again running for Congress. But why bother? The 2014 election will mark the fourth time in four years that Djou has run for the 1st Congressional District seat representing urban Oahu. 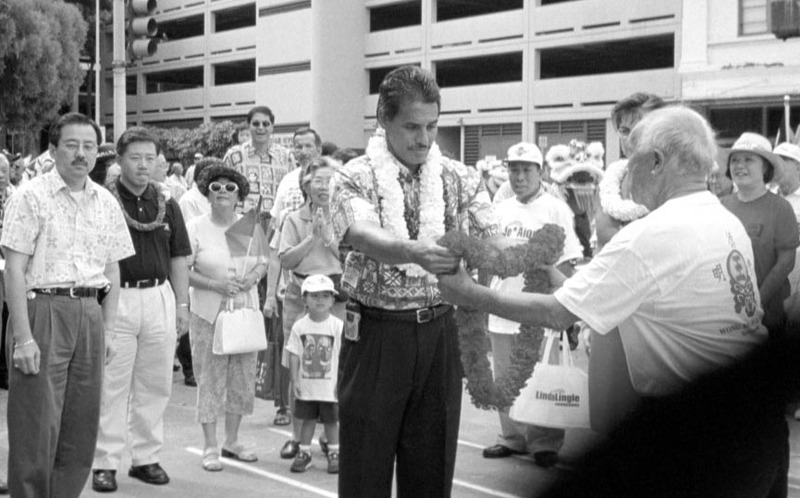 He has won only once, in the May 2010 special election to replace Neil Abercrombie, who resigned to run for governor. 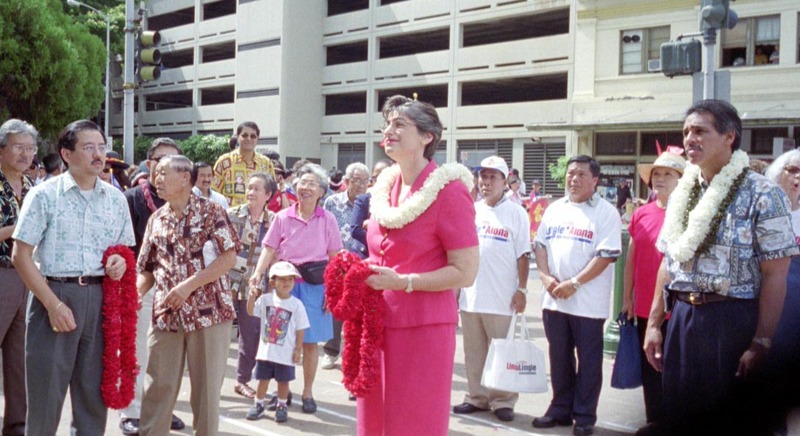 That race saw Colleen Hanabusa and Ed Case split the votes of Democrats and independents; Djou received 39 percent of the winner-take-all contest and went to Washington for just over seven months. 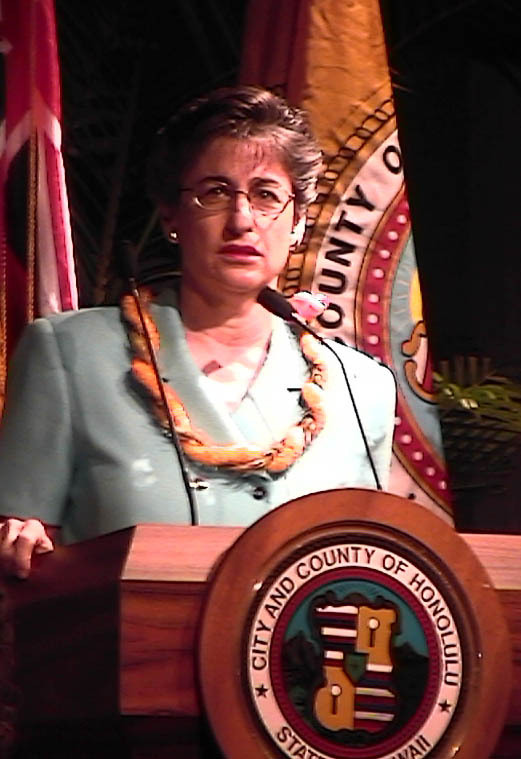 Case elected not to oppose Hanabusa in the 2010 Democratic primary, and she then defeated Djou in the November general election by 6 percentage points. 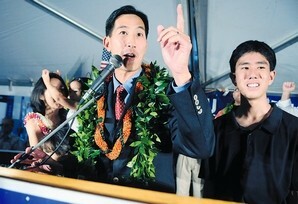 In the 2012 rematch, Hanabusa won by nearly 10 percentage points over Djou. Now, Hanabusa is running against Brian Schatz in the U.S. Senate contest, leaving the CD 1 seat open. 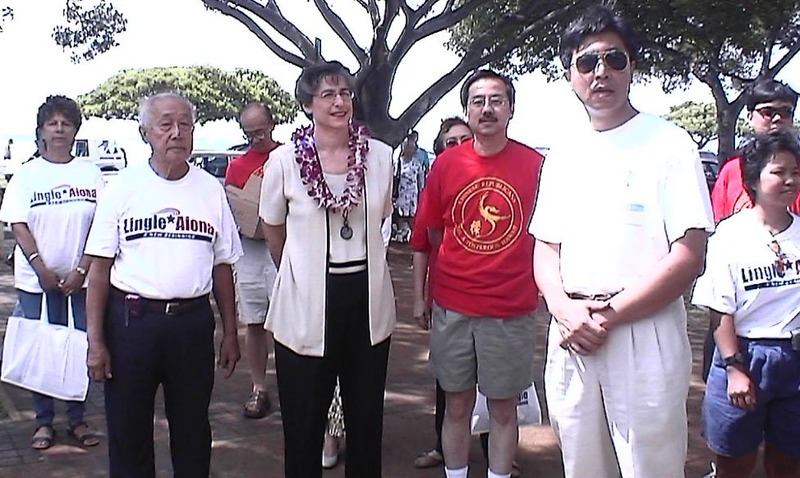 History is not on Djou's side. 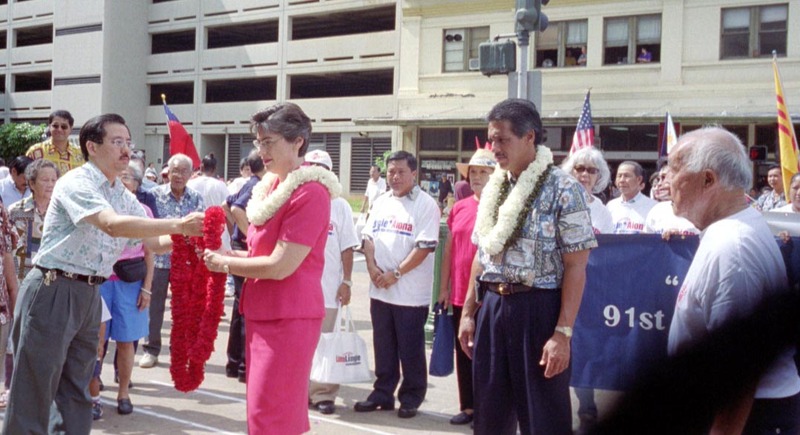 Hawaii has only sent three Republicans to D.C. since statehood in 1959. But here are eight arguments for why he just might pull it off. 1. Djou has the most congressional experience. Sure, seven-plus months is not a whole lot of time, but he did serve and he has a voting record. 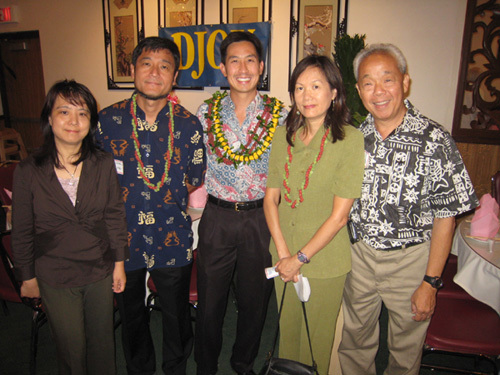 None of the seven Democrats running for CD 1 have held office in D.C. More importantly, Djou still has D.C. contacts. While national Republicans are unlikely to throw campaign money his way -- the GOP seems certain to retain control of the U.S. House and they have a real shot at the Senate -- Djou will probably be able to leverage his relationships. 2. Hawaii may want a Republican voice in D.C. 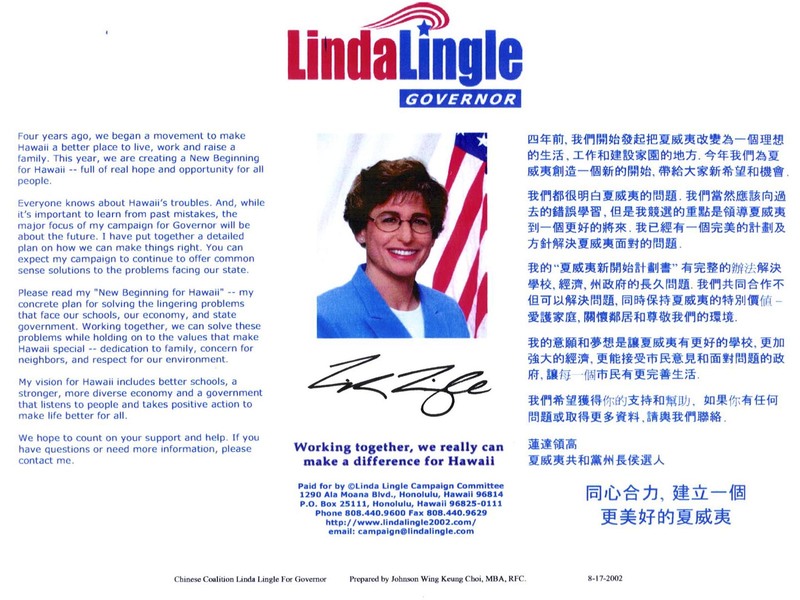 This was the argument that Linda Lingle made when she ran against Mazie Hirono for the Senate in 2012. Lingle got trounced, and her political career is probably over. But Djou can make the argument that he would best deliver for Hawaii, especially if Republicans win control of both houses of Congress. 3. He's a military veteran. The fact that Djou is a major in the U.S. Army Reserves who deployed to Kandahar Province in Afghanistan in 2011-2012 didn't help him much in his 2012 race. 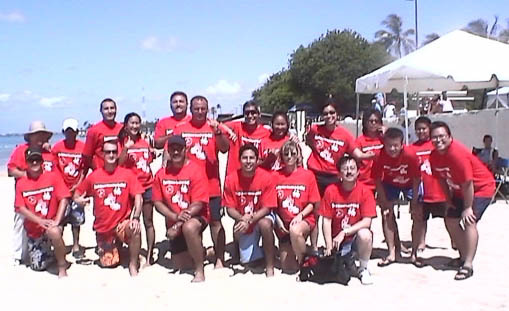 But Hawaii is fond of its military heroes; witness Tulsi Gabbard's meteoric rise. 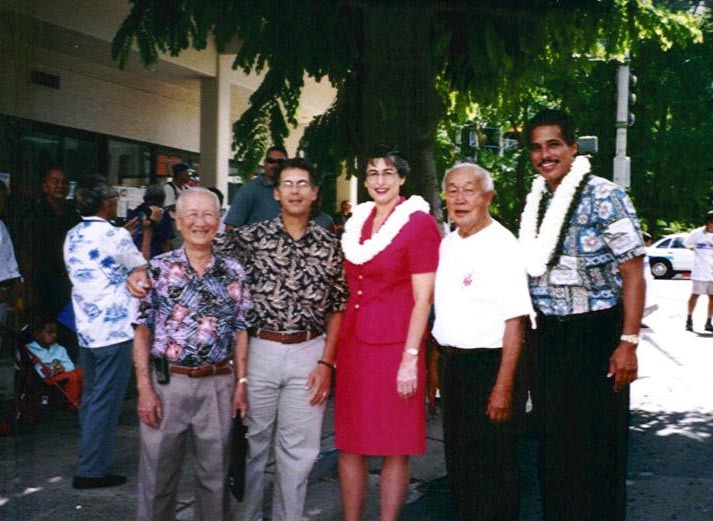 Among Democrats running for CD 1 this year, only Mark Takai has comparable veteran status. 4. Pat Saiki is the GOP Party Chair. 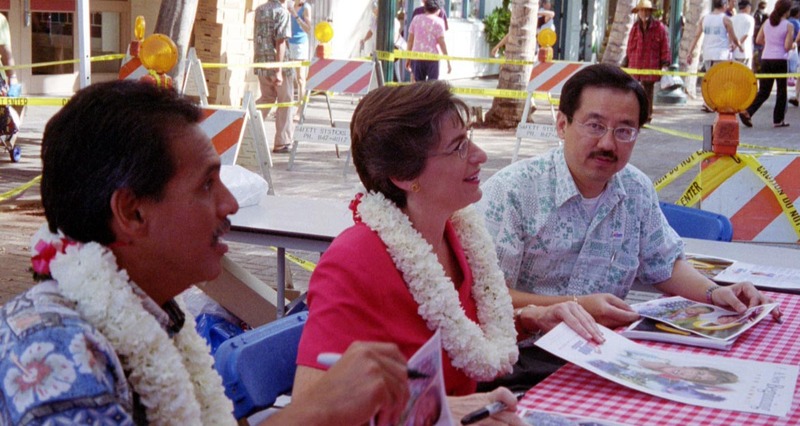 Hawaii's Republicans are in disarray once again, led by a revolving door of party chairs. Saiki is holding the job on a temporary basis. 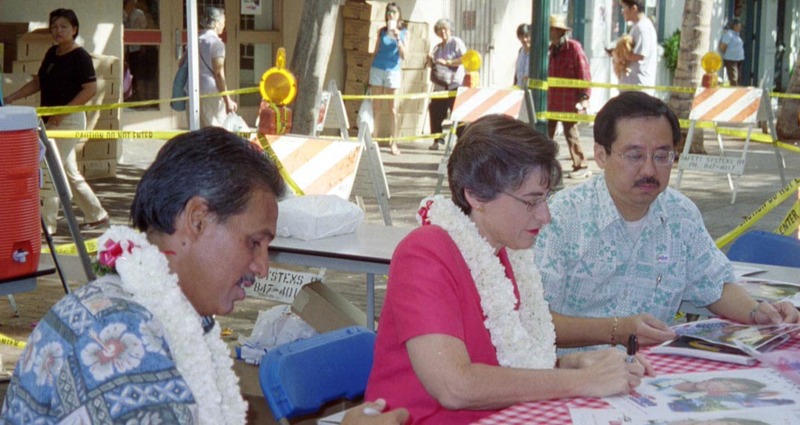 But aside from Djou, the late Hiram Fong and Saiki are the only other Republicans that Hawaii has sent to represent the state in the nation's capital — in fact, in the same CD 1 seat. 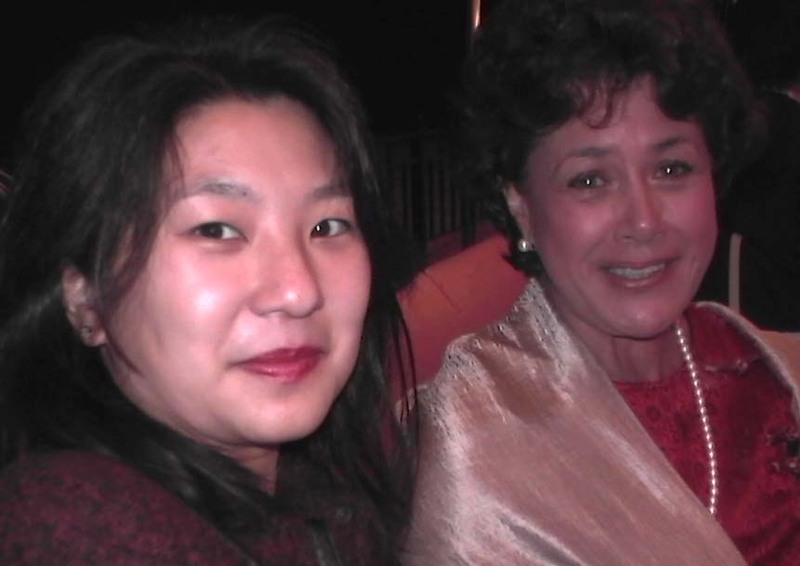 Saiki is a moderate Republican, and there is still a lot of love for her among Republicans and even voters outside of the party. 5. 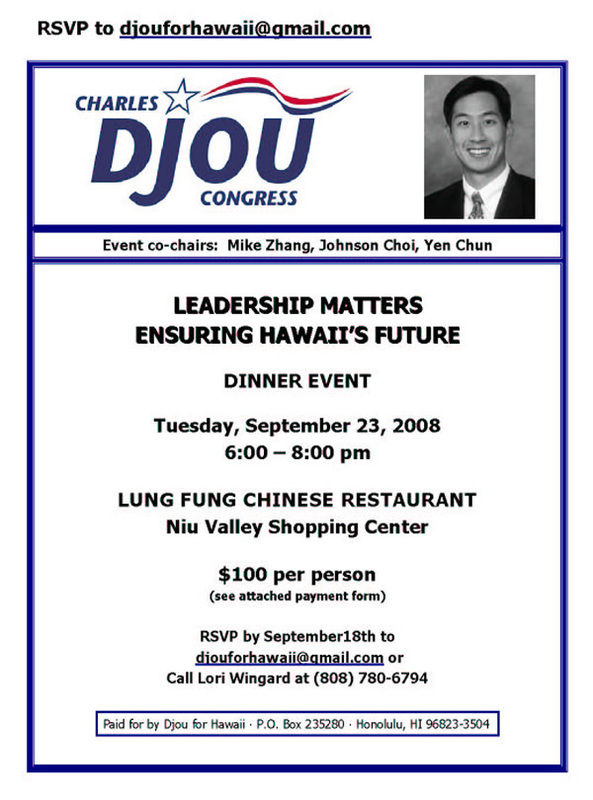 Djou has run before. Yes, he lost three out of four times. But he did manage to attract nearly 100,000 votes in 2012, an increase of 15,000 from the 2010 race. None of the Democrats in the race have ran before in a district as large as CD 1, which takes organization, canvassing and get-out-the-vote efforts. 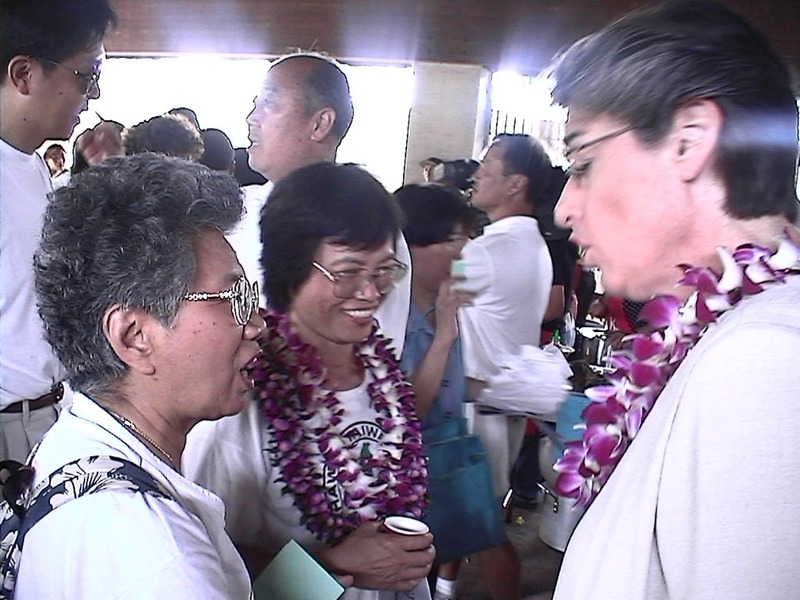 Djou also has wide name recognition, something only Democrat Donna Mercado Kim can lay claim to. He knows federal issues, and he can hold his own in a debate. 6. 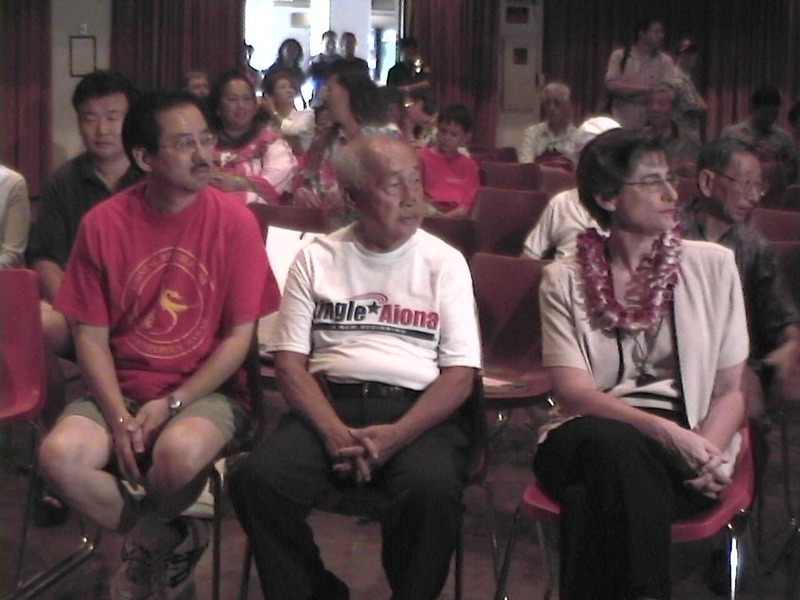 Djou is an appealing candidate. 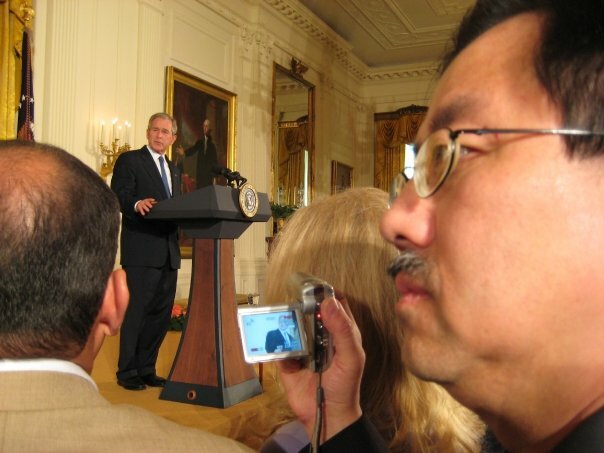 In addition to his military service, Djou is the child of immigrants (from China and Thailand), a Punahou graduate who holds political science and economics degrees from the Wharton School of Finance and Commerce at the University of Pennsylvania, and a law degree from the University of Southern California. 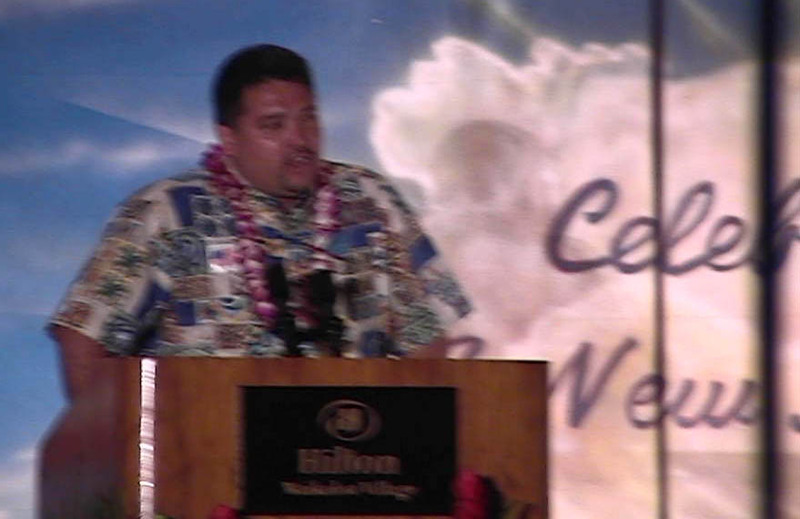 His wife, Stacey, is local, a Kalani High School grad who earned her own law degree at the University of Hawaii. They have three adorable kids. 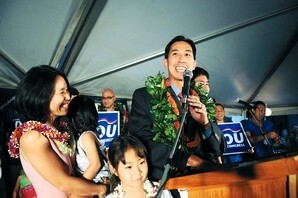 Djou turns 44 on Aug. 9 -- primary day. 7. 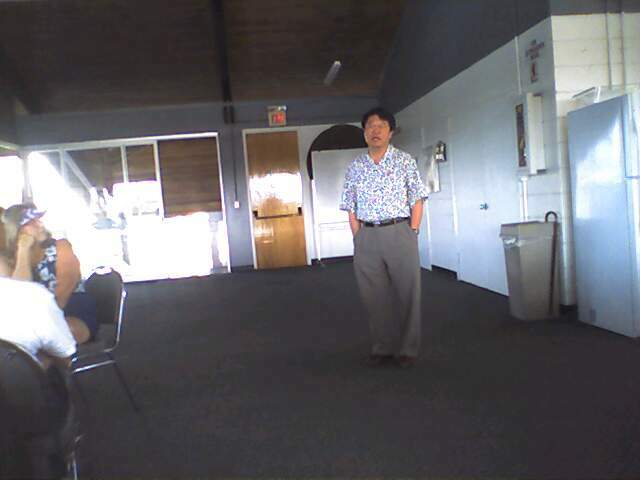 Djou loves his country and his state. Most every politician does, of course. 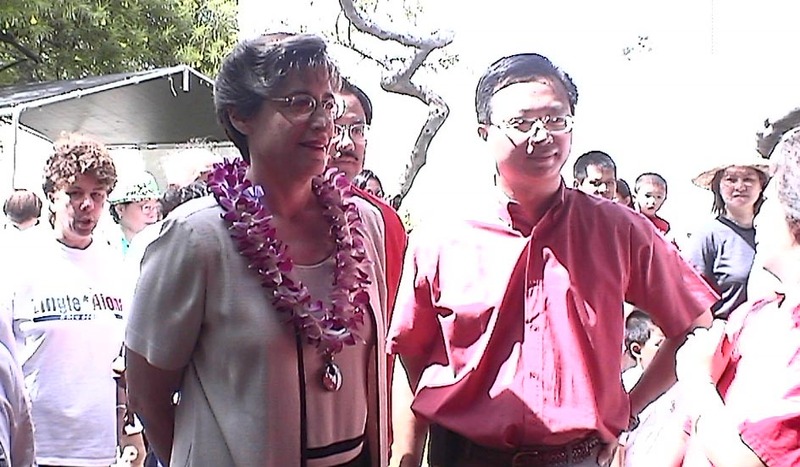 Yet, Djou joined the Army Reserve one month after Sept. 11, 2001. "I did so because I believe in America and everything our country stands for -- freedom, liberty and equal opportunity," he explains on his congressional campaign website. "But, our government today is failing us. The politicians in office simply aren't listening. Partisan politics has become more important than people. We need leaders who will fight for our country, our children and our future -- to create jobs, and make sure people can afford to live in our beautiful state." 8. 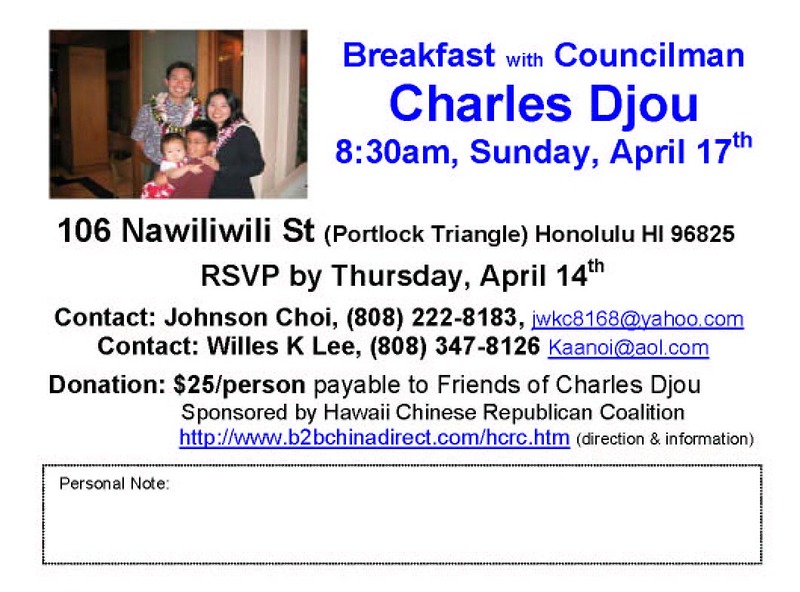 Djou has a memorable last name. As he explains on his campaign website, Charles's grandfather worked for a French engineering company in Shanghai in the 1920s where his French boss only spoke French and Chinese. 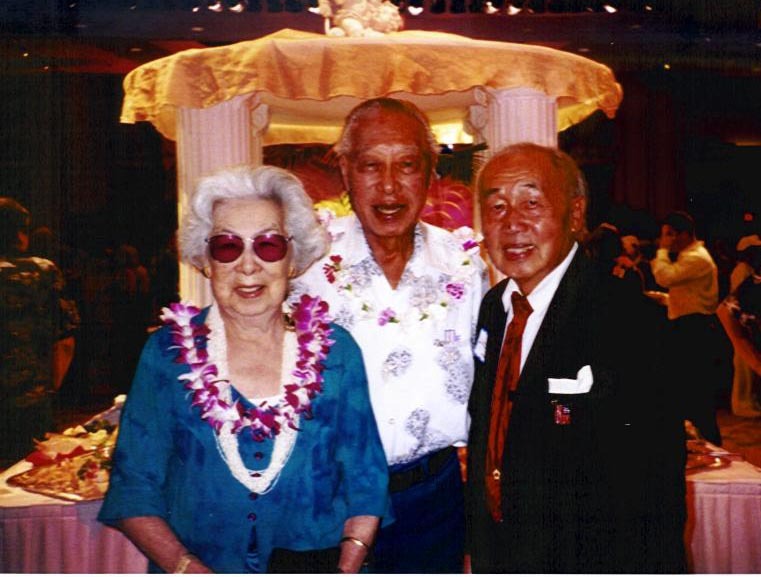 The boss called Djou's grandfather "Dijou," which sounds somewhat like his grandfather's Chinese name "Zhou." 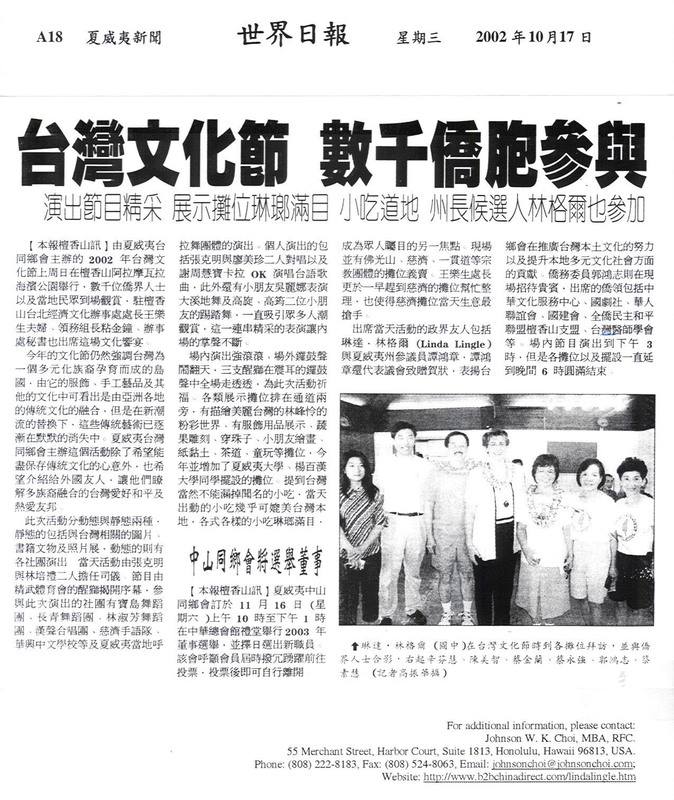 With the communist revolution beginning in 1948, Djou-Dijou-Zhou fled to British-controlled Hong Kong, and "Djou" was the name he wrote in his immigration papers. 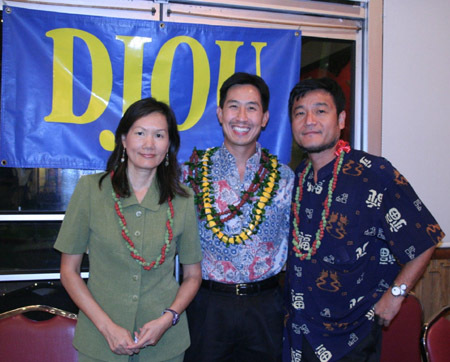 Djou is a former state legislator and Honolulu city councilman. Some political pundits thought he might run for the U.S. Senate to face Schatz or Hanabusa in November. There was talk he might run for governor, too, which would have pitted him against Duke Aiona in the GOP primary. Still others thought he would run for mayor at some later date. We are the bluest of states, and even with an unpopular native son in the White House, we still love Barack Obama. We like health care, too, and most of us don't care for the tea party types in Washington who are bent on repealing Obamacare. 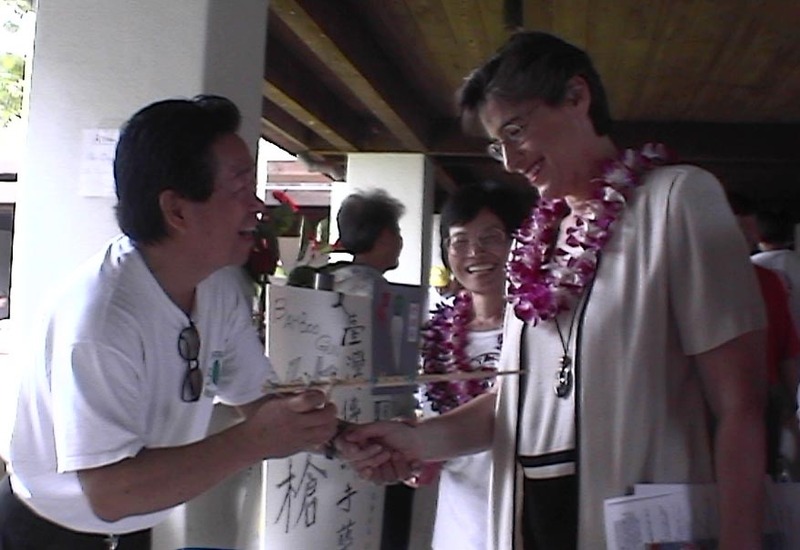 And, as attractive a candidate as Djou is, it's hard to shake a loser label. He can also come across as the smartest guy in the room who happens to know it. 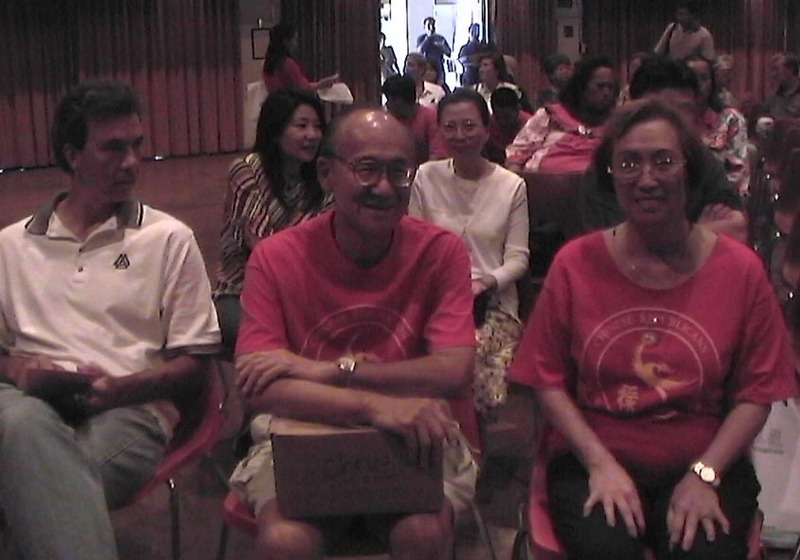 But Charles Djou is Hawaii Republican's best hope for high office. The last 36 hours have been a whirlwind! I am about to board an airplane for Washington DC to be sworn in as your next congressman, but I could not leave without expressing my deep gratitude to you for your kind words, support, encouragement and your generous donation of time and resources. As I said on Election Night, I could not have done any of this alone. Thank you to all of you who so generously volunteered your time and resources. It is only because of all of you who stood with me in the hot sun sign waving for hours every morning and afternoon, sat with me as we reached out to voters by telephone, and walked with me door-to-door in our communities, that we were able to convey our message of much-needed fiscal responsibility and government accountability. I must also thank the people of Hawaii – Republicans, Democrats and Independents - for standing up and voting for change in Washington. I understand that I have been given a tremendous privilege – but also a great responsibility – to fight for the best interests of the people of Hawaii. I take that responsibility seriously and, for every single day that I am fortunate enough to serve, I will never forget the faith and confidence you have placed in me. While our win was significant, this is just the beginning, not the end. Now the real hard work begins. If you graciously agreed to place a yard sign in your home or business, please consider leaving it there until November. If you volunteered your time, please consider doing so again. If you contributed financially, please consider doing so again with a contribution of $25, 50, or $100. As I said on Election Night, the people have granted us a short term lease with an option to buy in November. While I understand that we have been given a great privilege, with that comes a tremendous responsibility to do good, to bring change, and to restore our nation to prosperity. Together we can do just that. Because of the help and support you offered, today I had the honor of taking the oath of office as a member of the United State Congress. I was sworn in just before 9am Hawaii time by House Speaker Nancy Pelosi and then delivered my first address from the House floor. This was an exciting and exhilarating day. My family and I caught a flight to Washington D.C. less than 48 hours after winning our special election. Immediately after arriving at Reagan National airport my wife and I went to the Capitol to receive my member official pin from the House Clerk, visited our office at on Capitol Hill for the first time, and then took the oath of office in the House chamber. 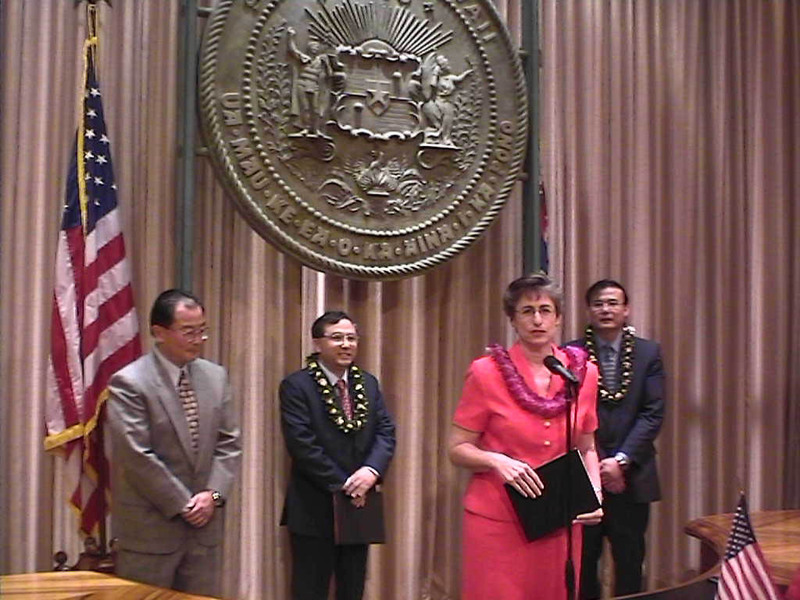 I am excited to quickly get to work for the people of Hawaii. 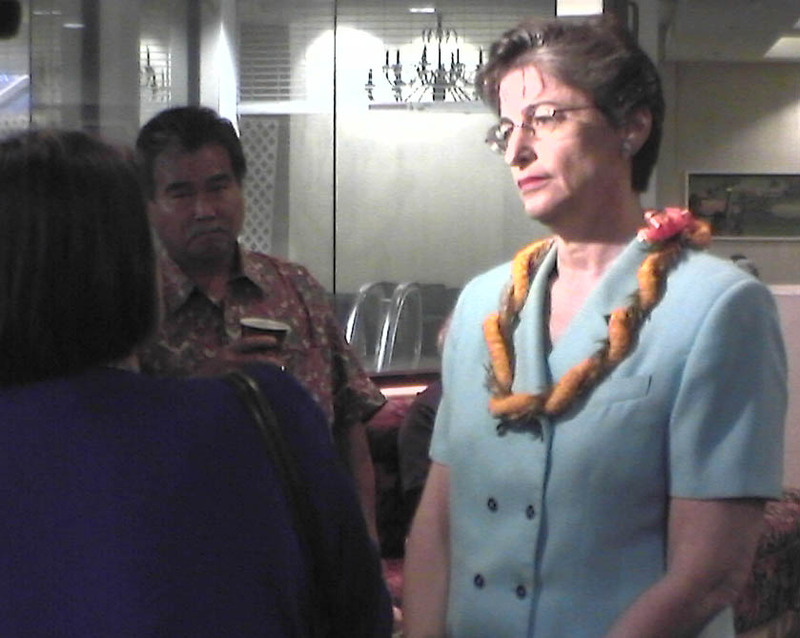 I am humbled that I hold the office of U.S. Representative for Hawaii. I only hold this seat because of your support and the confidence given to me by the voters. The people of Hawaii have vested an enormous responsibility in me and I look forward to proving that the trust you have given to me is deserved. 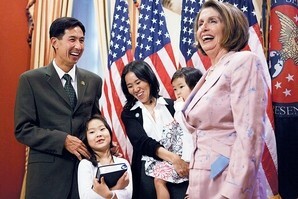 House Speaker Nancy Pelosi, D-Calif., welcomed newly elected Rep. Charles Djou, R-Hawai'i, and his family yesterday on Capitol Hill in Washington, D.C. Djou was sworn in May 25 2010. 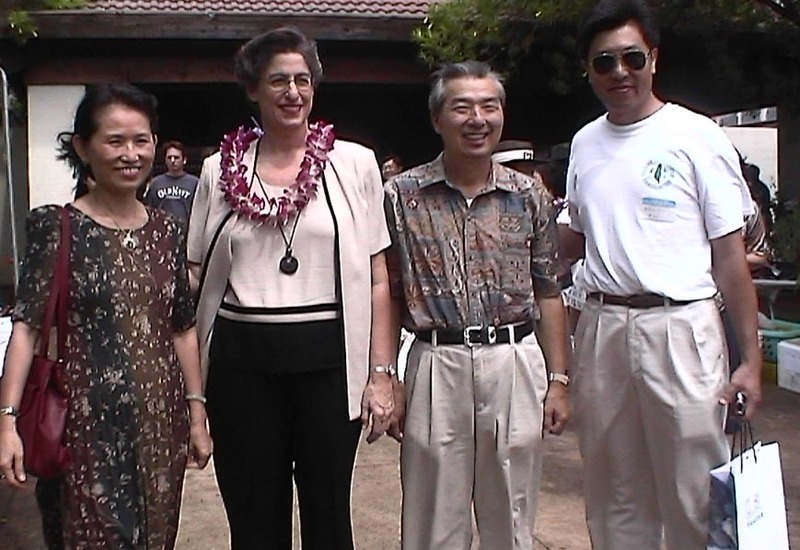 From left: Djou, his daughter, Victoria, 7; wife, Stacey; daughter, Alexandra, 3; and Pelosi. 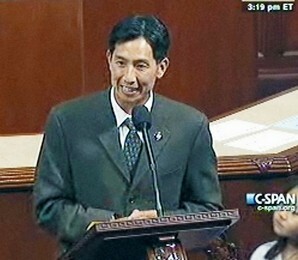 Charles Djou tells his new colleagues how grateful he is to have the "amazing privilege" of serving in Congress. Congressman-elect Charles Djou's strength remains in more conservative East Honolulu, but he demonstrated in his special-election victory Saturday night that he may be able to compete with Democrats in central and west side territory that could be critical in the November general election. 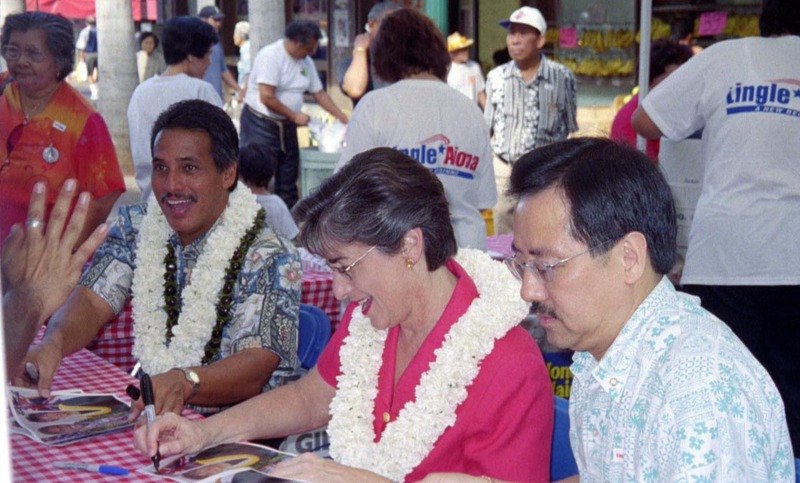 Djou, a Republican, took most of urban Honolulu's 1st Congressional District because state Senate President Colleen Hanabusa and former Congressman Ed Case split the Democratic vote. An Advertiser analysis of the vote by state House district found that Djou performed well in potential swing districts around Mililani and 'Ewa Beach. While the combined vote for Hanabusa and Case was still larger than Djou's markers, there is no guarantee all these voters would stick with the Democratic nominee in November. Hanabusa trailed Case in East Honolulu but did better than the former congressman in every district west of Makiki — an encouraging sign for her campaign against Case in the September primary. 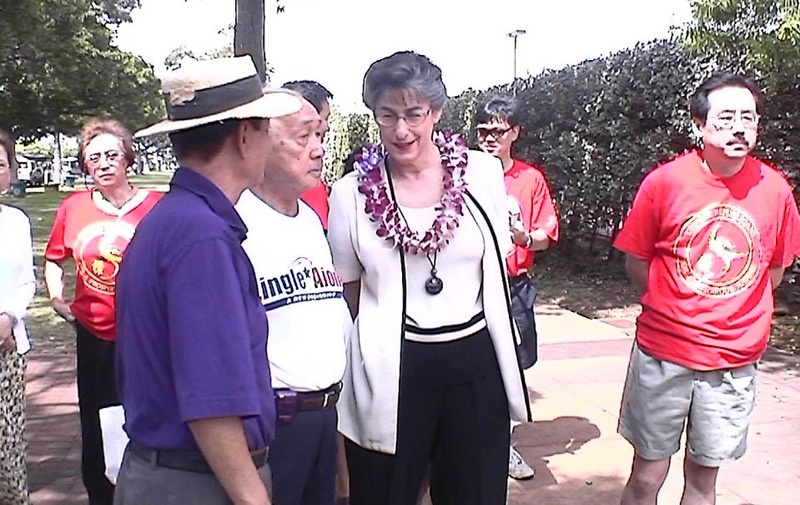 Hanabusa's muscle in the most solidly Democratic territory of urban Honolulu, combined with her expected edge in fundraising and the organizational help from establishment Democrats and labor unions, gives her the advantage in the primary. Djou, who could be sworn in to fill out the remaining months of former Congressman Neil Abercrombie's term as soon as tomorrow in Washington, D.C., said he considers himself the underdog in November. 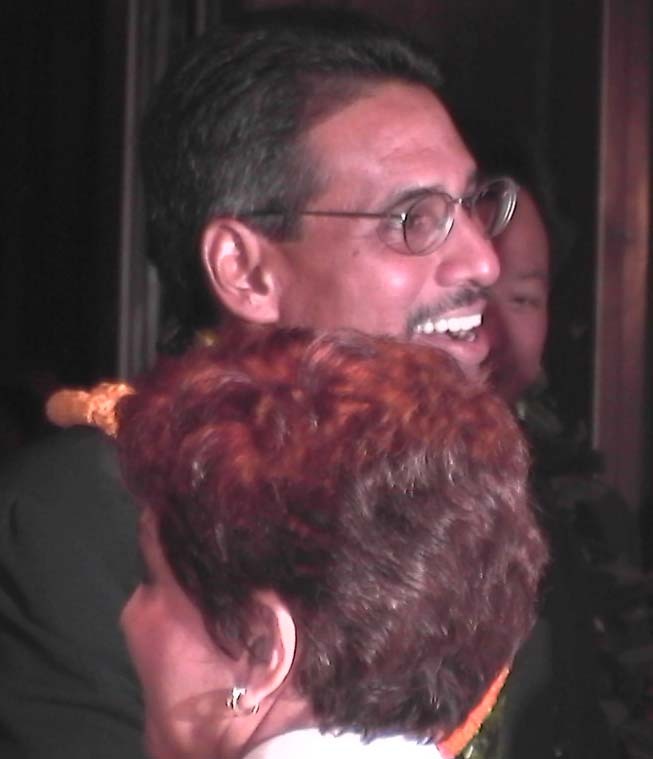 He said he would be leaving the Honolulu City Council this week. 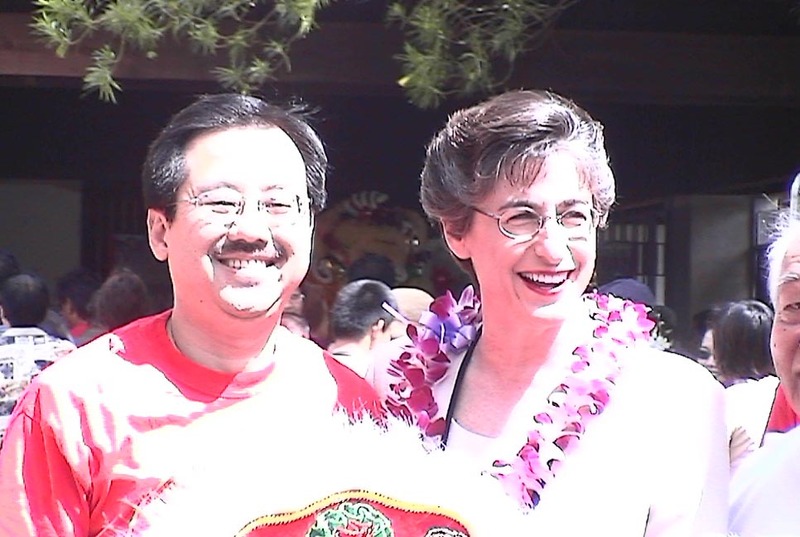 "I realize that this is an uphill battle, although I have been given and granted an extraordinary privilege to be a congressman, and, of course, it is an advantage to run as an incumbent," Djou said yesterday at state GOP headquarters. "I still realize, looking into the November election, I'm still the underdog, and I still have to prove to the people of Hawai'i that this trust they have granted to me is deserved." Djou said he believes the independents and moderate Democrats he must win to hold the district in November are, like other voters, frustrated with the direction of Congress and interested in greater fiscal responsibility. He said that with three leading candidates in the special election, there was a lot of overlap on issues, but he thinks the issues will be much more defined in a two-candidate race. 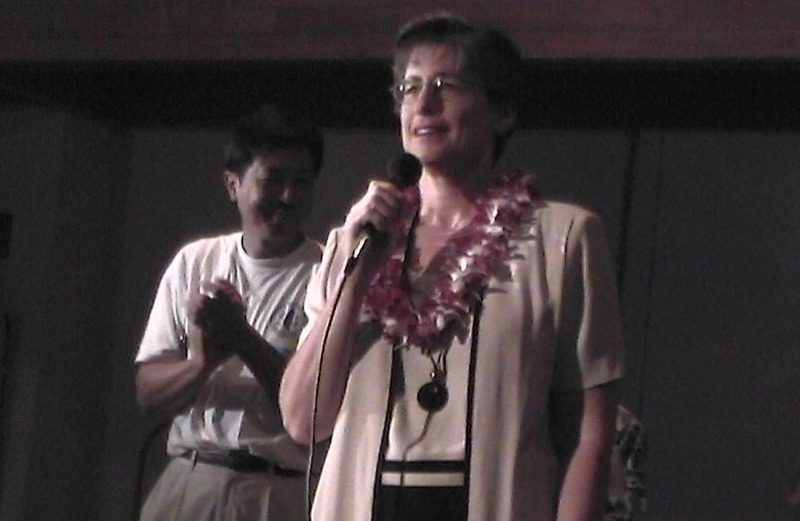 Democrats sought to connect Djou to the conservative extremes of the national GOP during the special election. Democrats will now scrutinize every significant vote Djou takes over the next several months in Congress to try to show he does not reflect the views of most urban Honolulu voters. 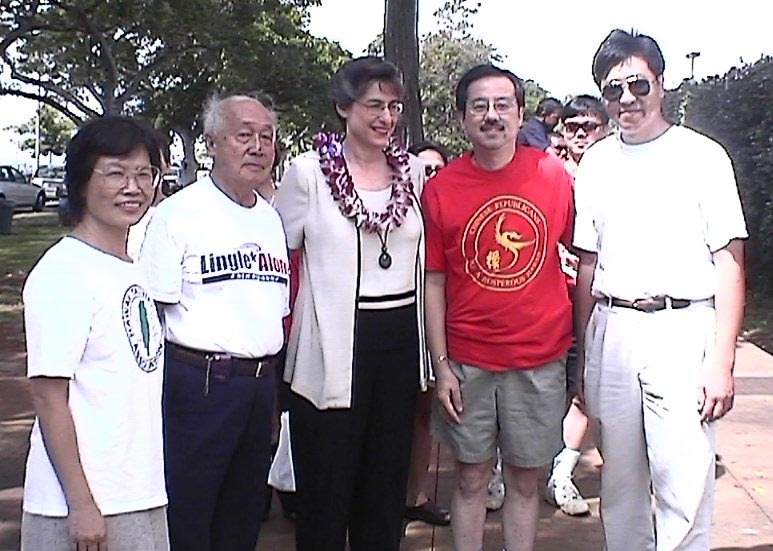 "As sharp as the elbows were in this special election, they are going to get even sharper in the general election," Djou said. "The only thing I can point to is my record. 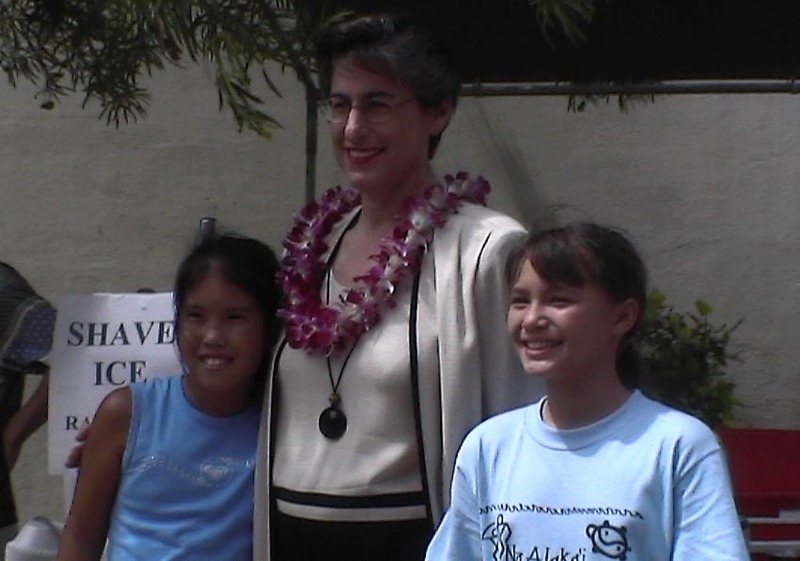 It's my record over the last 10 years on the council and the Legislature of being an effective representative and putting my constituents first, making sure that it's Hawai'i first, ahead of my personal or partisan interests." Djou, who will be the only Republican in the state's congressional delegation, said he does expect to side with Hawai'i Democrats and President Obama on certain issues. But, he said, "if they're doing something that I believe is not in the best interest of the people of Hawai'i, I will call them on it." Hanabusa said the special election showed that she is the stronger Democrat despite Case's claims over the past several weeks that he was the only Democrat who could challenge Djou. She said voters stood behind her even as Case and some national Democrats suggested that a vote for her would be wasted. She said her performance showed that the grassroots outreach from her superior network of activists and volunteers was effective. "We probably got thrown the worst curveball by being called irrelevant and being called a wasted vote," she said. "But the people stuck by us and voted." Late appeals by Obama, three former Democratic governors and other leading Democrats to vote for a Democrat — not singling out Hanabusa or Case — helped boost turnout to 54 percent and likely drove more votes toward Hanabusa. 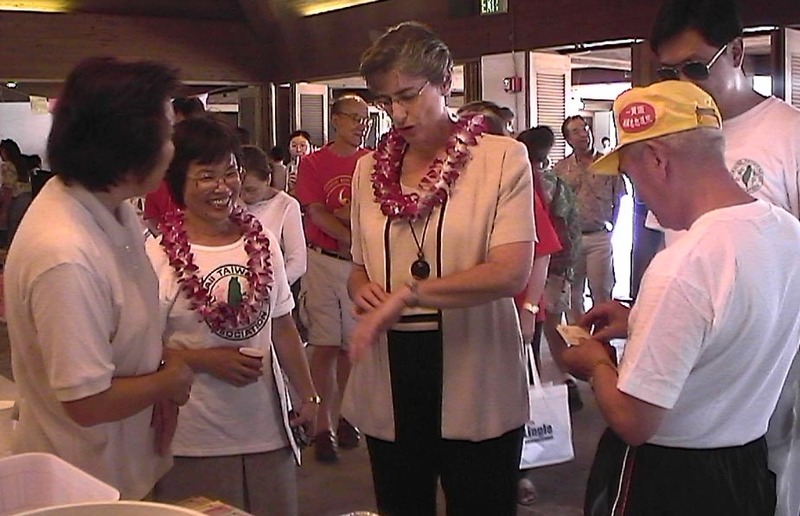 Hanabusa won state House districts centered in St. Louis Heights, Mō'ili'ili, Kalihi, Kamehameha Heights, Waipahu and Pearl City. "I think our gut was correct," she said, countering the assessment by many national Democrats that Case was the more electable Democrat. 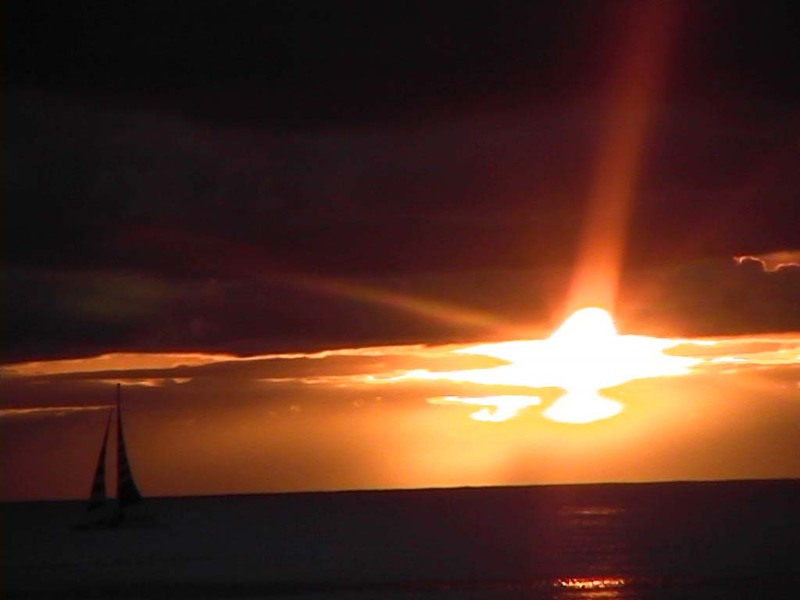 "Hawai'i is a special place, and people here look at politics a lot differently." 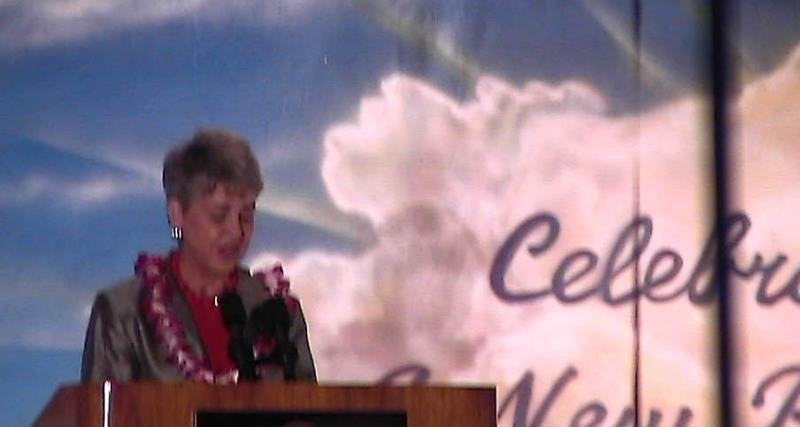 Hanabusa said the message from Saturday night is not to presume how voters will act. "You never underestimate the voter," she said. 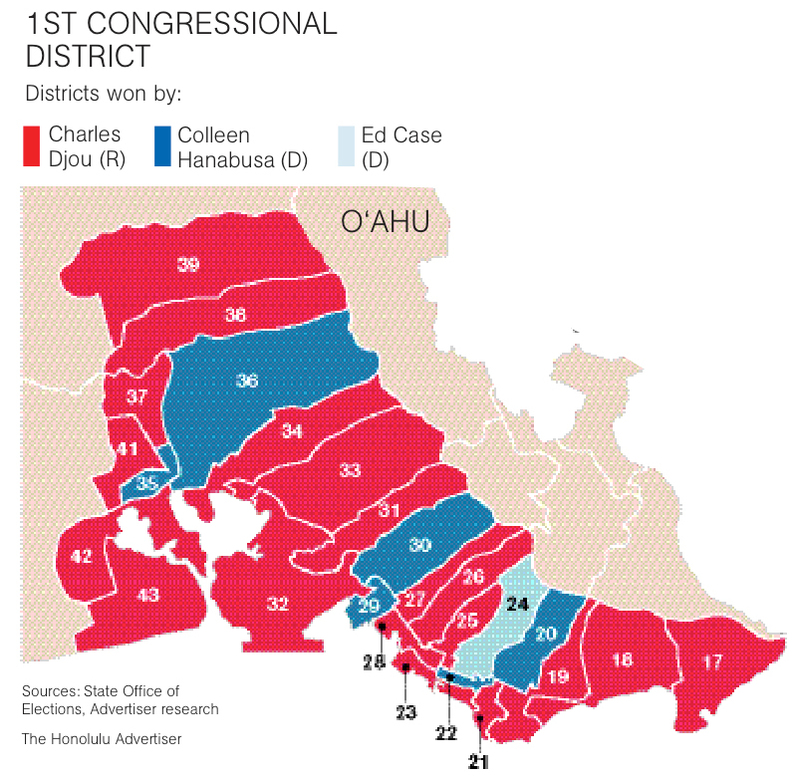 Case captured the state House district he used to represent in Mānoa but trailed in every other district. 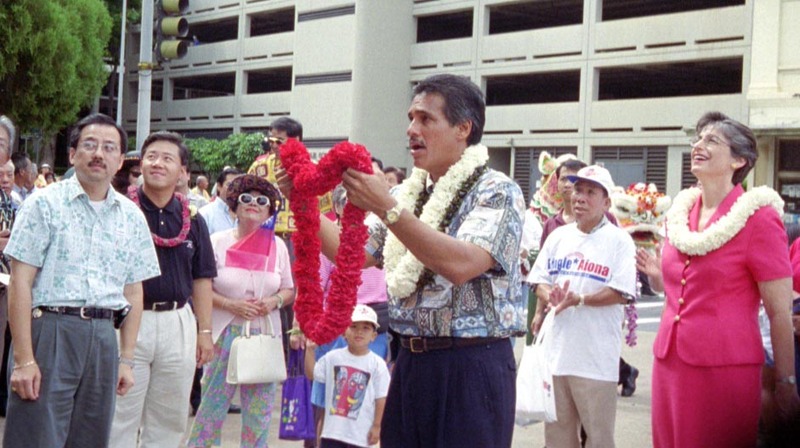 Some Democrats are concerned that the primary could further divide the party and give Djou a manual on Hanabusa's and Case's weaknesses. 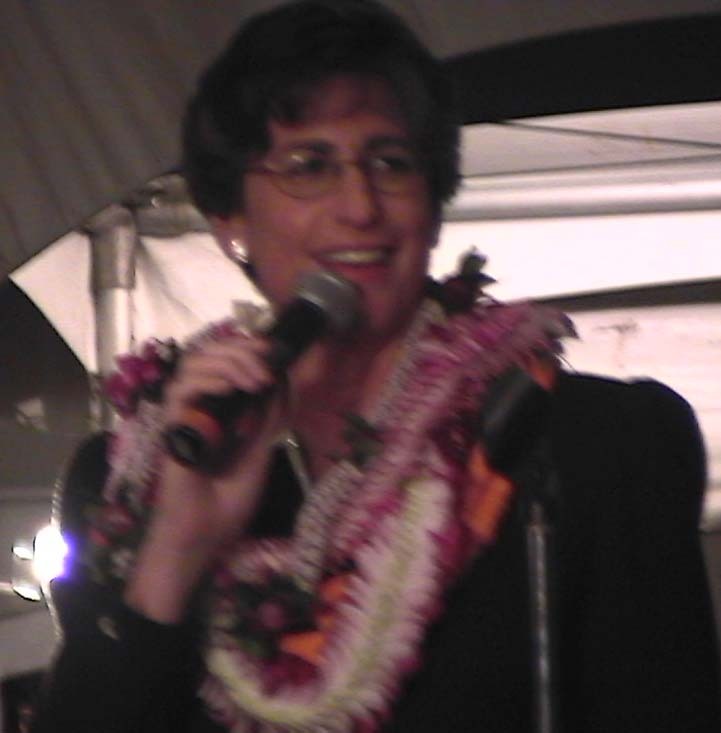 When Case, a moderate, lost a close primary for governor to Mazie Hirono in 2002, for example, a Hawai'i Poll found that nearly half of Case's voters said they planned to vote for Linda Lingle, a Republican, in the general election. 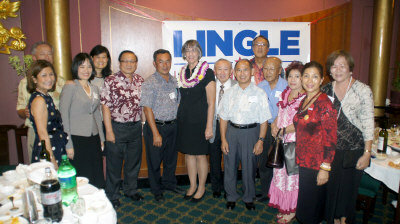 Lingle beat Hirono and claimed 14 of the 16 state House districts that Case had won in the primary. In a statement last night regarding the special election, Case said, "There's no way to sugar-coat a loss." Case said he called Djou to offer his congratulations "and offer my assistance as he undertakes his new responsibilities on Capitol Hill for the next seven months." Yesterday, Case said, "I actually did go bodysurfing at Point Panic, get a start on cleaning up my mess of a yard, and spend time with my family. 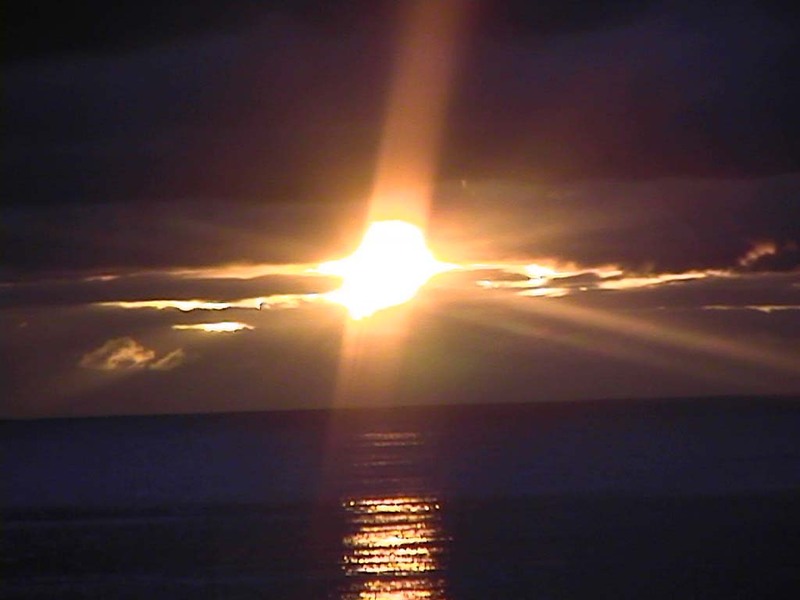 But tomorrow is a new day, the start of our next chapters together, and I'm excited to begin anew." 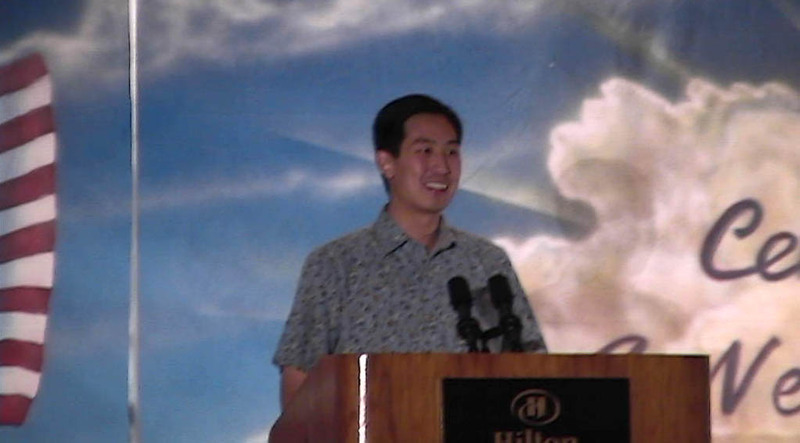 Honolulu City Councilman Charles Djou punctured the Democrats' hold on the state's congressional delegation last night, winning a special election for Congress and becoming the first Republican in two decades to represent the Islands in Washington, D.C.
Djou earned 39.4 percent of the vote in the winner-take-all special election in urban Honolulu's 1st Congressional District and took advantage of a bitter split among Democrats between state Senate President Colleen Hanabusa and former congressman Ed Case. Hanabusa, who had been trailing in third in most public and private polls, finished second with 30.8 percent, positioning herself well for the September primary. Case took 27.6 percent and will have to climb back against a wall of opposition from establishment Demo-crats and labor unions who will help Hanabusa in the primary. The winner of the primary will take on Djou again in the November general election, when Djou will need to appeal to more independents and moderate Democrats if he is to stay in office. 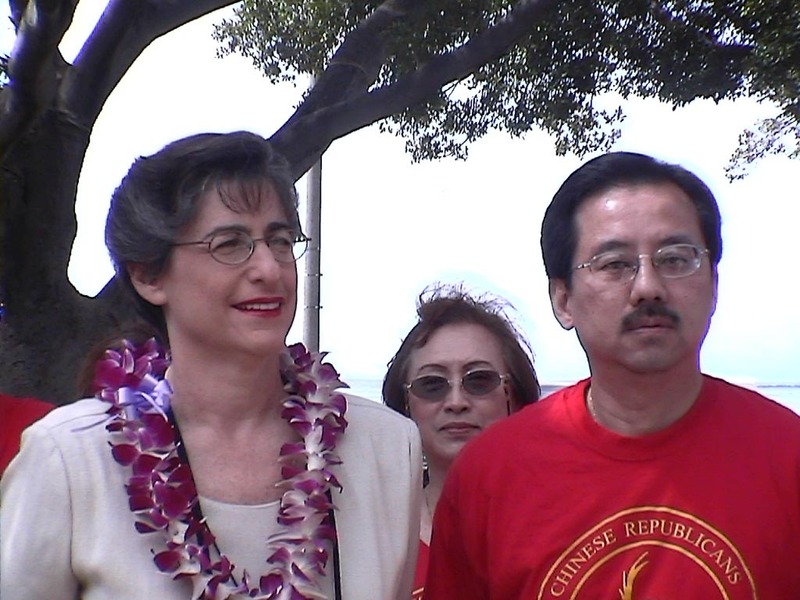 "I think we sent a clear message to Washington, D.C., that we are spending too much money and that we need more fiscal responsibility, and I look forward to going to Washington, D.C., and Congress to do exactly that," Djou said outside the state GOP's headquarters. 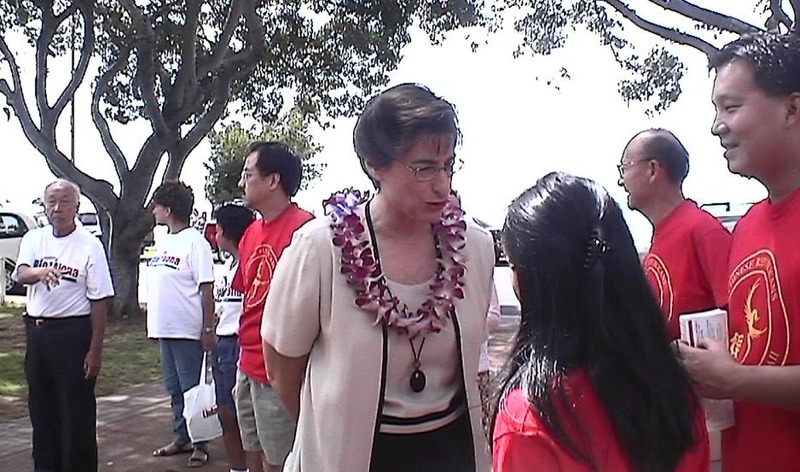 Djou will fill out the remaining months of former congressman Neil Abercrombie's term, which expires in January 2011. Djou will have to run in the Republican primary in September, but is expected to win easily. 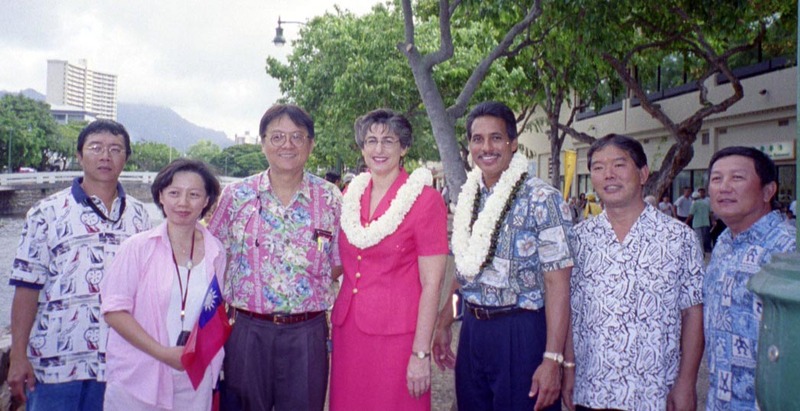 Djou becomes the third Republican — after former U.S. Rep. Pat Saiki and the late U.S. Sen. Hiram Fong — to represent Hawai'i in Washington since statehood. Hanabusa said she believes her campaign had the most effective grassroots organization. 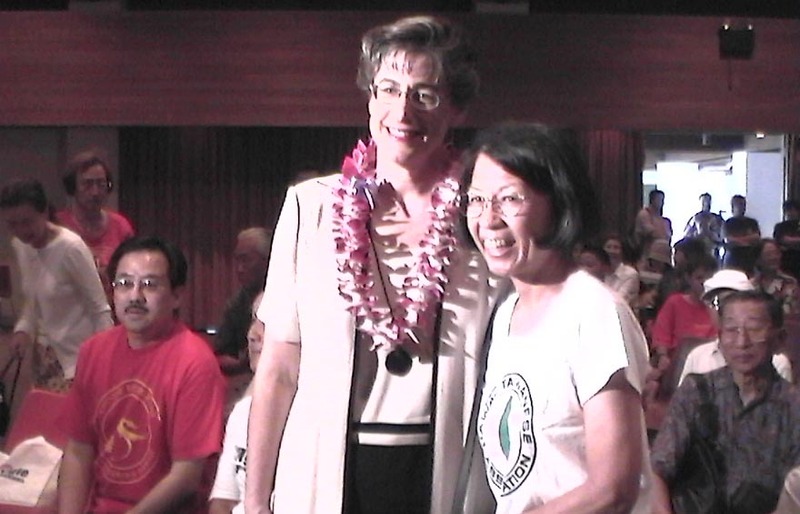 "This is what defines Hawai'i politics — it's the personal touch," she said. Hanabusa said she had heard anecdotally that some people may have voted for her after watching television advertisements critical of Djou and Case and also after national Democrats suggested privately that she should step aside for Case. Her supporters, gathered at her campaign headquarters off Ward Avenue, regarded second place as a victory. 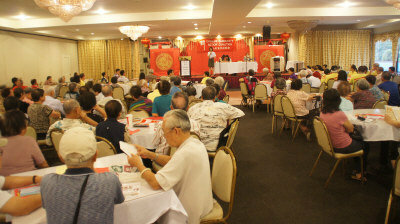 "From the volunteers' standpoint, it's a win," Hanabusa said. "You have to think about what they and this campaign have had to deal with in terms of the adversity, the naysayers and everyone else who came in and said we didn't have a chance. We come in second even despite that." 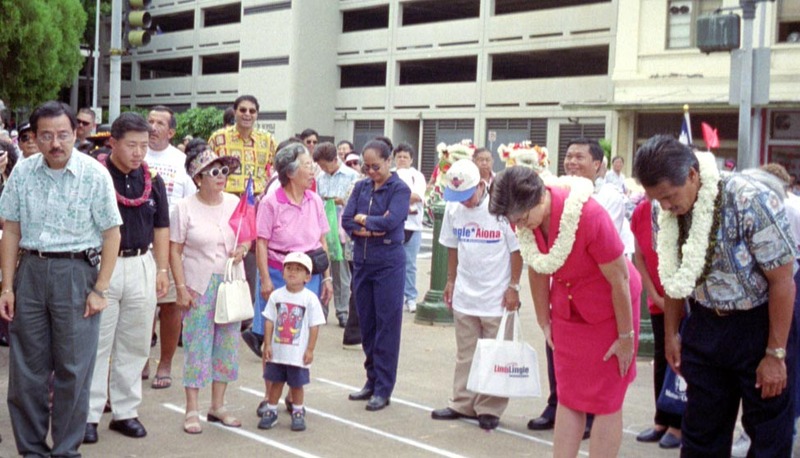 Case had been describing the campaign as between him and Djou for the past several weeks, particularly after several national Democrats indicated that they thought he was the Demo-crat with the best chance of beating Djou. 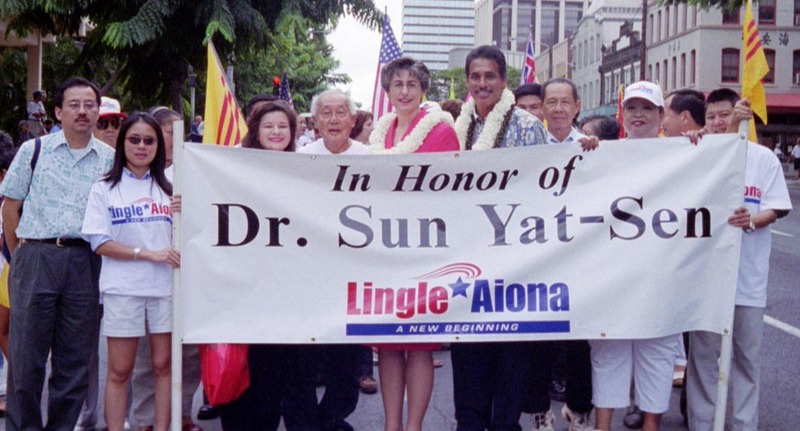 Case was the target of negative television ads from Djou, Hanabusa and Mainland groups such as the conservative Independent Women's Voice. "I think what happened is the sum total of probably $1 million worth of attack ads leveled at us by both Hanabusa and Djou, especially Djou," Case said. "She got a free pass on the attack ads. She was basically not attacked at all, and I was. "She just kind of flew under the radar and I took the hit. Charles obviously viewed me as the principal threat, otherwise he would have been attacking her." Voter turnout was 54 percent of the 317,337 eligible voters in the state's first all-mail special election for Congress after two Honolulu City Council special elections last year. Many voters interviewed said they were looking for change. 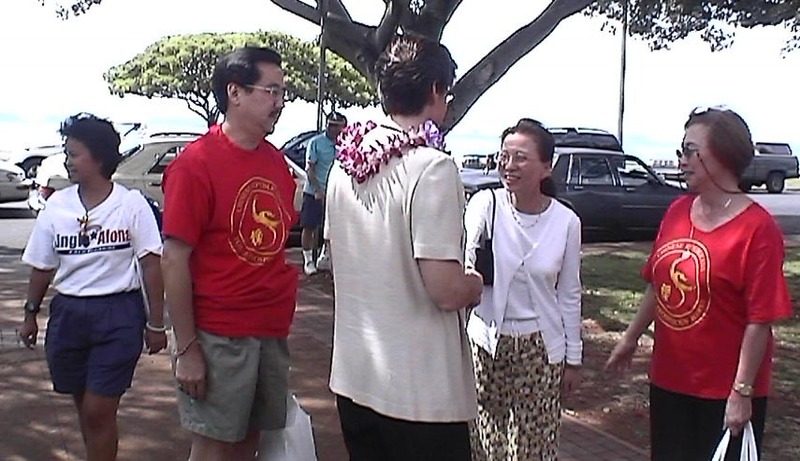 "He has bright ideas and he's a fresh face," Beris Paik, a retired school teacher who lives in Kāhala said of Djou, adding that she believed he would resist pressure from the labor unions that often influence majority Demo-crats. "I believe that people are pretty tired of the old faces." Cherylynn Gatiuan, a homemaker who lives in Pearl City, said she shares Djou's conservative values and likes that he was the only one among the three leading candidates to oppose civil unions. She also said the state could benefit from a change in Democratic control of the congressional delegation. "I think it would help in certain areas, because sometimes it's just so overrun with the Democratic Party instead of listening to other things that might work," she said. Joey Lee, a carpenter who lives in Waipahu, believed Hanabusa was more in tune with the concerns of average workers struggling through the economic downturn. Lee said Hanabusa was "closer to us." 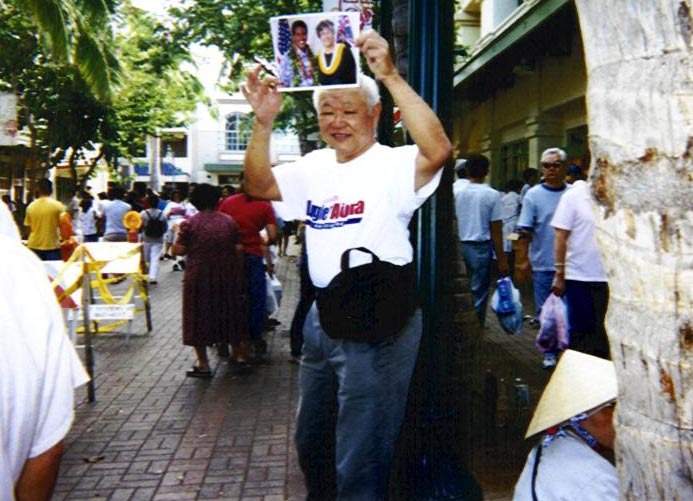 Don Kroessig, a private school teacher who lives in Hawai'i Kai, said he liked what Djou and Hanabusa have accomplished in local and state politics but believed Case was ready to go to Washington. "My political perceptions are similar to what he presents," he said of Case's moderate views. "To me, it's being pragmatic. If you're going to get things done, it's about negotiations." Gov. 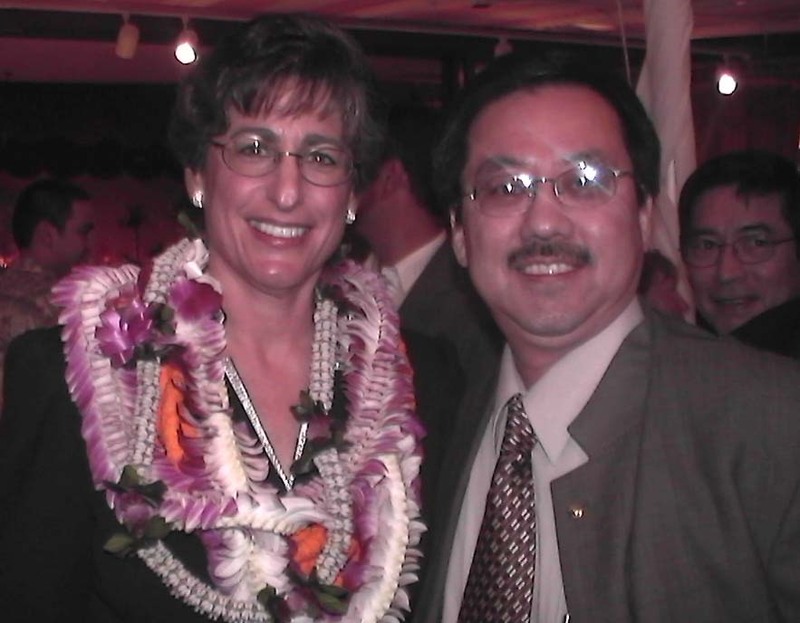 Linda Lingle, who was able to attract independents and moderate Democrats in her two Republican victories for governor, said Djou should continue with his message that he would put Hawai'i before his political party. "What I did, and what he has done, is told people in a very sincere way, 'I'll do what's best for everybody, I'm not going to go with any special interest, even if it's my own party sometimes that might want me to do a certain thing,' " the governor said. Lingle said "that's the key message that everyone should recognize. While we all run from a political party, you've got to be able to show that you would do what's best for everyone." 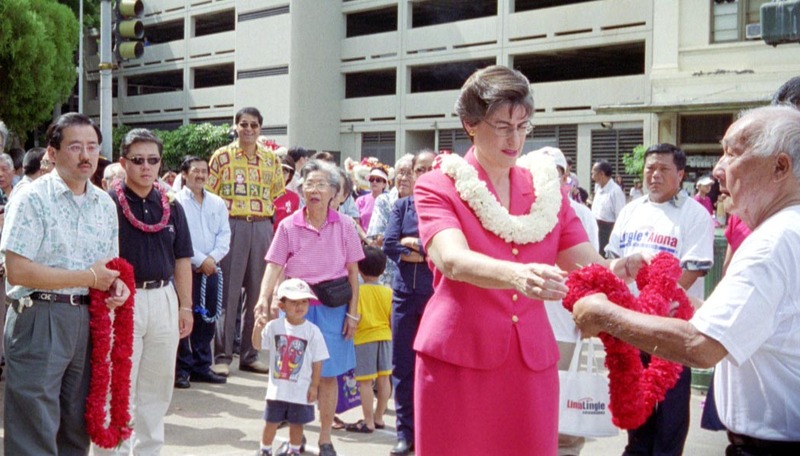 U.S. Sen. Daniel K. Inouye, D-Hawai'i, who endorsed Hanabusa, said the odds were against her given the dynamics of the special election. 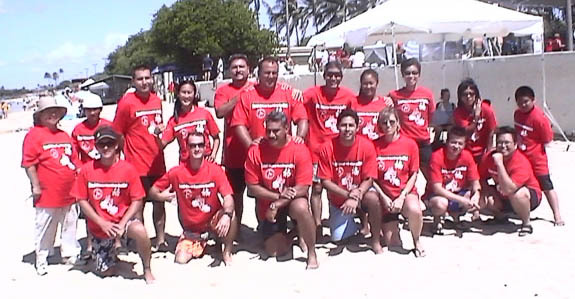 But he said her second-place finish indicate that she will be competitive against Djou. 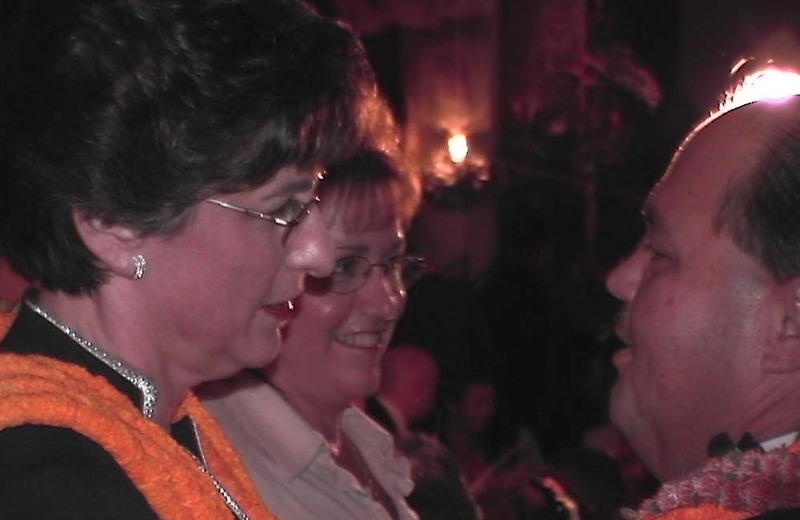 "The results would indicate that in November she should do very well," Inouye said by phone from Los Angeles. Inouye, who resisted pressure from national Demo-crats who wanted a clear path for Case, said the results showed they were behind the wrong candidate. "Well, I think the results would indicate that if they had just stayed silent the result could have been a little different," he said. 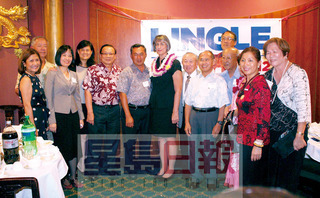 Inouye urged local Democrats to concentrate on Djou in November. "Just be a little patient because we'll do well this fall," Inouye said. Abercrombie, who resigned in February so he could concentrate on his campaign in the Democratic primary for governor, also predicted that Democrats will prevail in November. "The majority of voters in the district supported Democratic candidates in this special election," he said in a statement. "I am confident that a Democrat will win the congressional race in the general election. "The people of Hawai'i need a representative who will support President Obama's agenda and who will not cancel Hawai'i's other vote in the U.S. House." 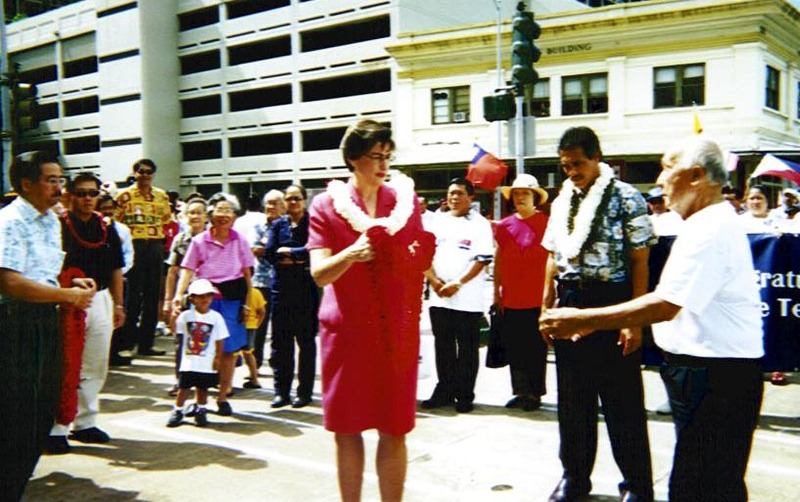 Djou started as an underdog. A poll taken in January for the Star-Bulletin and KITV by Mason-Dixon Polling and Research of Washington found the Republican trailing Case and Hanabusa with just 17 percent of the vote. At the time, national and local political analysts believed the race favored Democrats but warned about the uncertainty of the special election and the potential for Democrats to split their vote. 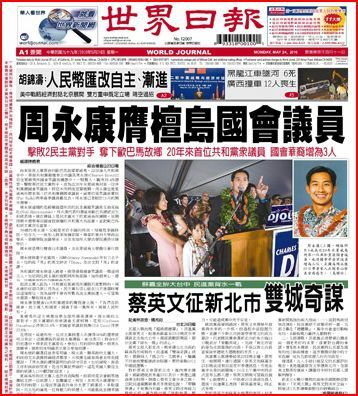 After Scott Brown's upset GOP victory in a special election for U.S. Senate in traditionally Democratic Massachusetts in late January, Djou and local Republicans said a Djou victory in Hawai'i would send an equally "profound statement" nationally. While national Republicans helped Djou with fundraising and advice, the National Republican Congressional Committee did not air television ads in the Islands and instead focused on a special election for Congress this month in Pennsylvania. "I congratulate Charles Djou for his victory and a successful campaign based on the widely shared values of cutting spending, shrinking government and creating real, permanent American jobs," U.S. Rep. Pete Sessions, R-Texas, the NRCC chairman, said in a statement. "I have no doubt that Hawai'i families will be well-represented in Congress as he joins our fight to return commonsense economic policies and fiscal sanity to Washington." The Democratic Congressional Campaign Committee spent $314,000 on television ads in Hawai'i against Djou but pulled out earlier this month after concluding that Case and Hanabusa were splitting the Democratic vote. 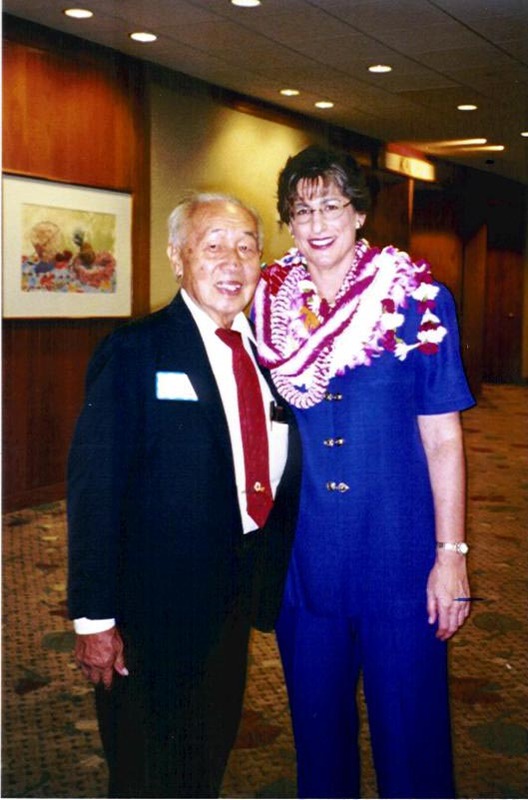 Inouye moved $150,000 of his campaign money to the DCCC to help finance the ad campaign and keep the group neutral. "Rather than reflecting a true contest of ideas, the outcome of this election reflects the unusual nature of a race that put two strong Demo-crats competing against one Republican in a winner-take-all contest," U.S. Rep. Chris Van Hollen, D-Md., the chairman of the DCCC, said in a statement. "As a result, the DCCC decided not to compete in this special election but to focus on the general election in November. "The fact that the Democratic candidates together received over 50 percent of the vote demonstrates that Democratic prospects are very good in November." 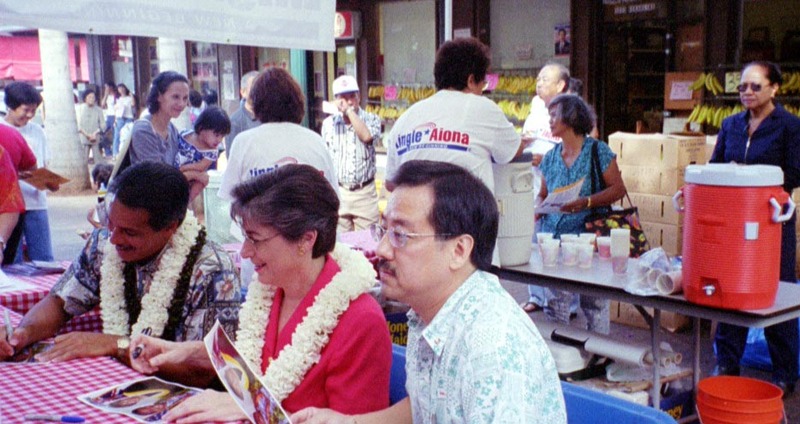 In May, the Hawai'i Poll taken for The Advertiser and a private poll taken for the Democratic National Committee found Djou leading and Case and Hanabusa splitting the Democratic vote. National political analysts changed their outlook to Republican. 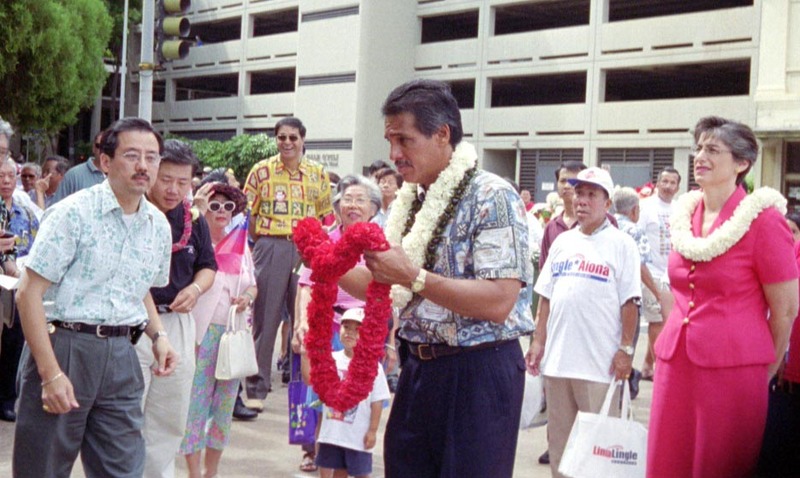 With Djou as the front-runner, Democrats shifted their focus to the September primary and November general election, when they will have a chance to take back the district. 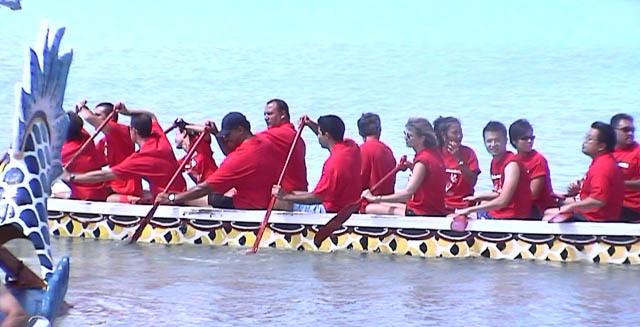 Dan Boylan, a University of Hawai'i-West O'ahu history professor and political analyst, said he does not know if unity is possible given the personalities involved. "It's going to be tough. I think it's going to be much tougher than they realize," he said. 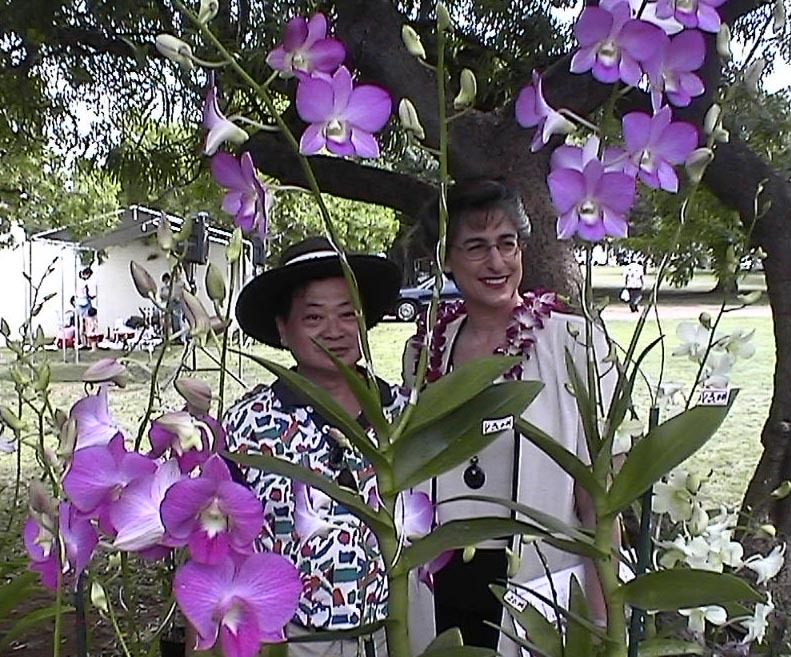 "It seems to me that there is no love lost, obviously, between Ed Case and Colleen Hanabusa." Staff writer Gordon Y.K. Pang contributed to this report. 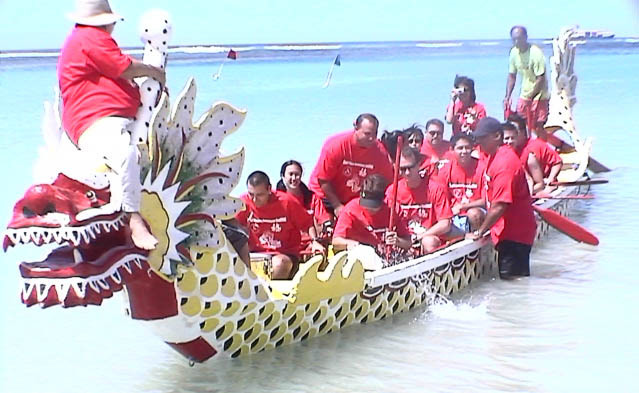 Reach Derrick DePledge at ddepledge@honoluluadvertiser.com or 525-8070. Palo Alto California USA June 27 2009 - Duke Aiona, Lieutenant Governor of Hawaii & 2010 Candidate for Governor of Hawaii. 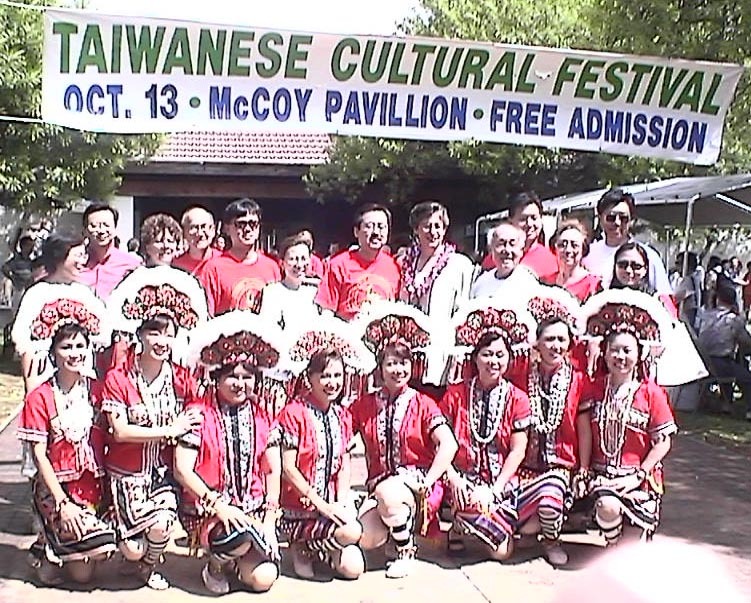 Hosted by Fred and Annie Chan. 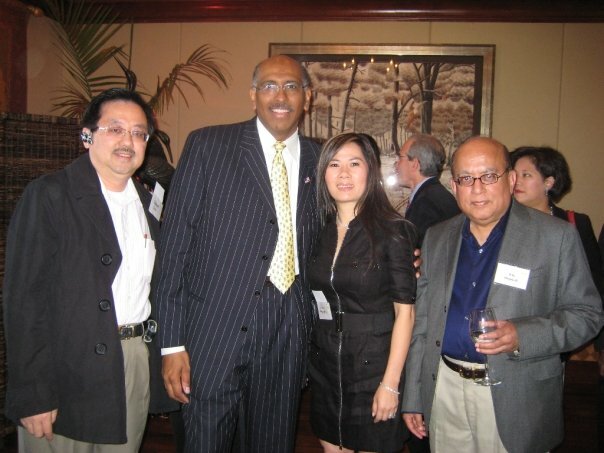 Guest Speaker: Michael Steele, Chairman of the Republican National Committee at Trader Vic’s, 4269 Camino Real, Palo Alto, CA - It has helped us to connect with many distinguished friends from Hawaii. 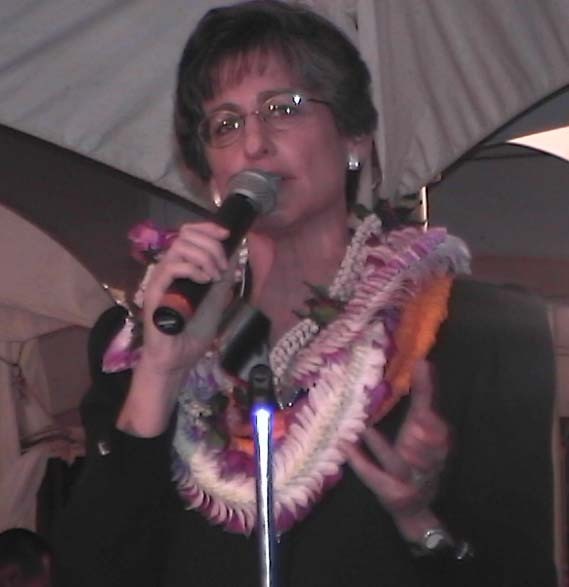 Meet Governor Linda Lingle in person and Republican candidates running for various Federal, State and County Offices at the Kekaulike Mall right in the heart of Chinatown. Voter registration desk will be closed by to handle NEW voter registration and address changes. 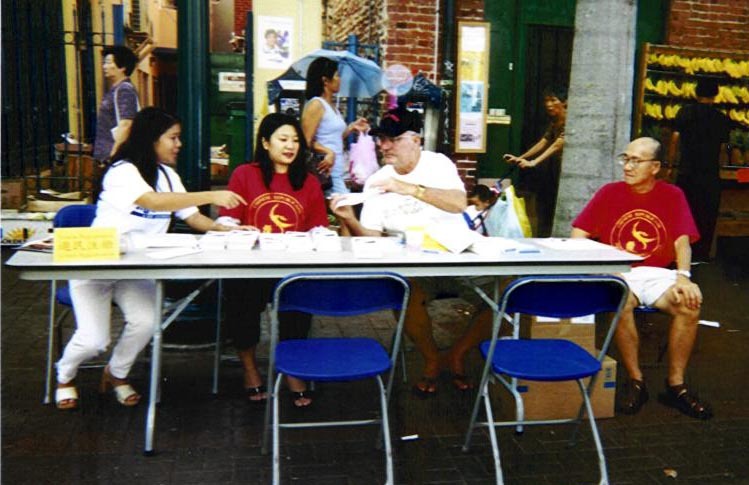 Bilingual voter registrars will be on hand to help you to complete voter registration forms. Throughout the upcoming election year, we will be continually trying to register new voters. I order to undertake this task of encouraging civic duty, we will need an army of voter registrars. Don’t forget to listen to the Rick Hamada Show on KHVH, AM830 "Hawaii’s Talk Radio". Call into the studio and support your Republicans at 521-8383 or *83 on your cell phone. Neighbor Islands can call toll free at 888-565-8383. Representative Mark Moses also hosts a Saturday morning Talk Radio Show on KWAI, AM 1080 every Saturday from 7 to 8AM. Join in on the conversation as he discusses current events and legislative happenings by calling in at 524-1080. The Battle of Nu'uanu & The Kamehameha Dynasty. 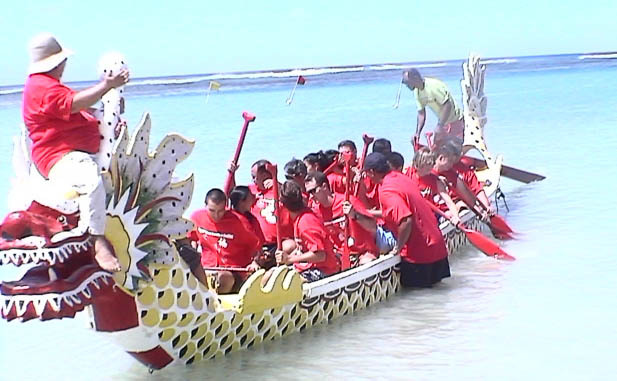 Re-trace King Kamehameha's Battle of Nu'uanu with a historical bus tour from 2:00PM to 6:00PM. Donation is $100 per person. For Reservations call Sam Aiona at 306-2444 or Kay Ahina at 220-4929. 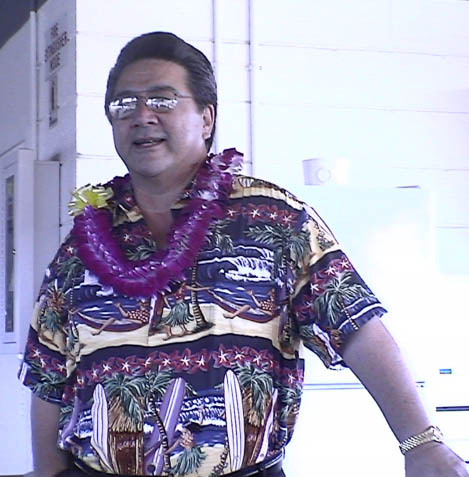 July 2 Campaign Kick-Off Fundraiser for Wilson Kekoa Ho (HD 51 Candidate) at Kalama Gardens at 41-1015 Waikupunaha St. in Waimanalo from 6:00 to 8:00PM. Donation is $25. For more information, contact Rosina at 259-7200. 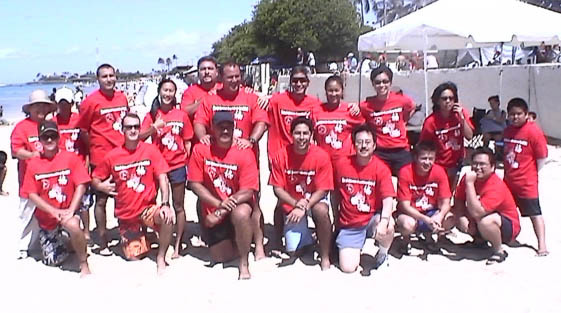 Join our Republican contingency at the Kailua 4th of July Parade. The HRP will also be collecting canned foods for the Hawaii Food Bank along the parade route, but food donations can be dropped of at Party HQ as well. More information to follow. 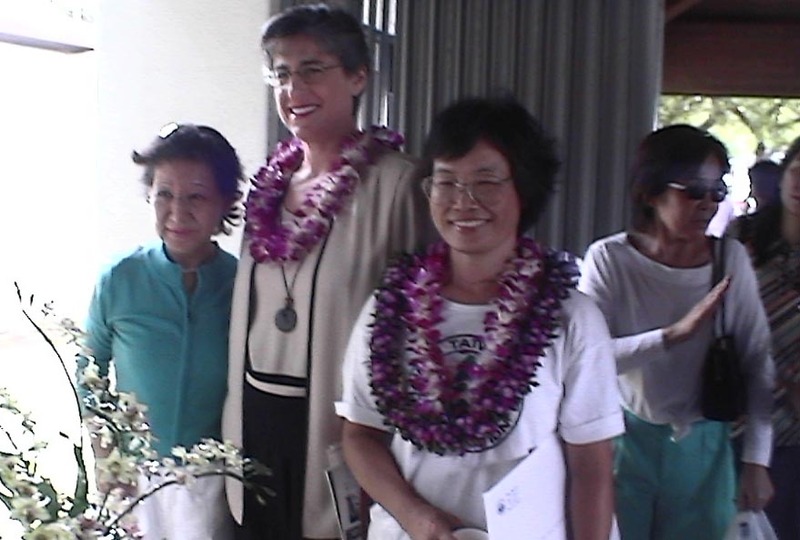 Fundraiser for Nadine Nishioka (HD 24 Candidate) at Treetops Restaurant at Paradise Park in Manoa from 5:30PM to 7:30PM. Ono food, entertainment, and lots of fun. Donation is $25. For more information, call 391-8145 or email nadinenishioka@yahoo.com. Fundraiser for Senate District 8 (HD 17 & 18). A Kumu Kahua Theater production of “Folks You Meet at Longs” by Lee Cataluna. 46 Merchant Street on the corner of Merchant and Bethel. 8 PM. Tickets are $25. 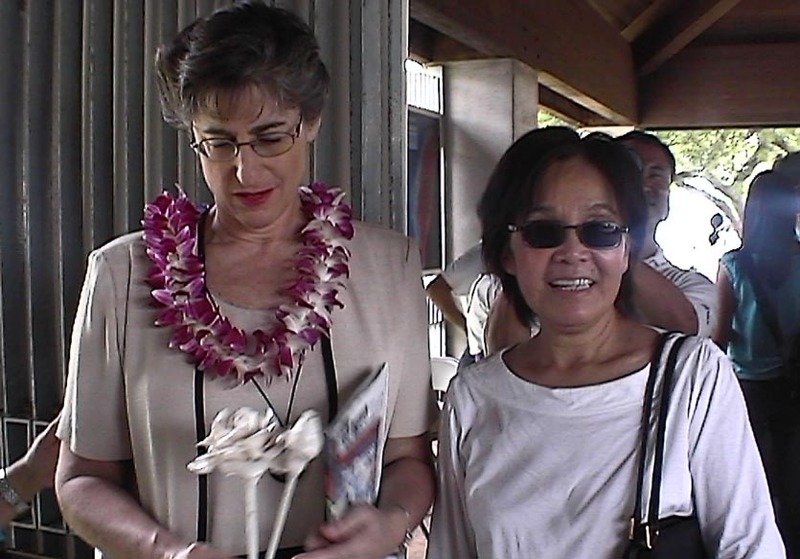 Make checks payable to 8th Senatorial District and mail to Maureen Muraoka at 1047 Kamookoa Place, Honolulu 96725. 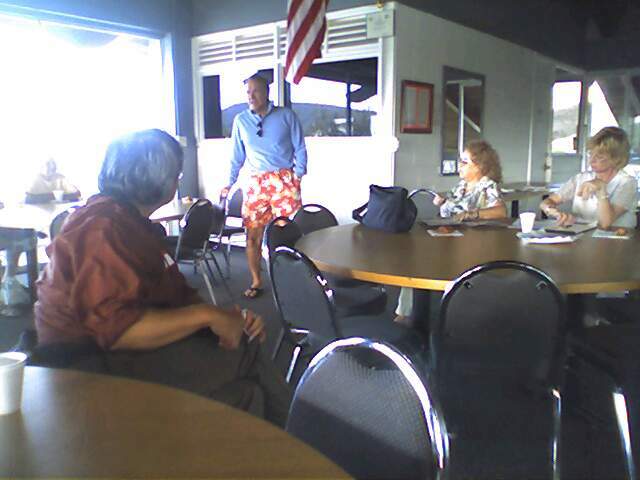 July 23 6th Annual Hawaii Republican Party Golf Tournament at the Hawaii Kai Golf Course. Great Prizes, Food, and Surprises at every hole. Various levels of hole sponsorships and individual teams. Check-in begins at 10:00AM and Shotgun start at 11:30AM. For more information, contact Beth Weems at 593-8180. July 31 Campaign Kick-Off Fundraiser for Keoki Leong (HD 48 Candidate) at Honey’s Restaurant at the Koolau Golf Course from 5:30 to 7:30 PM. Donation is $25. 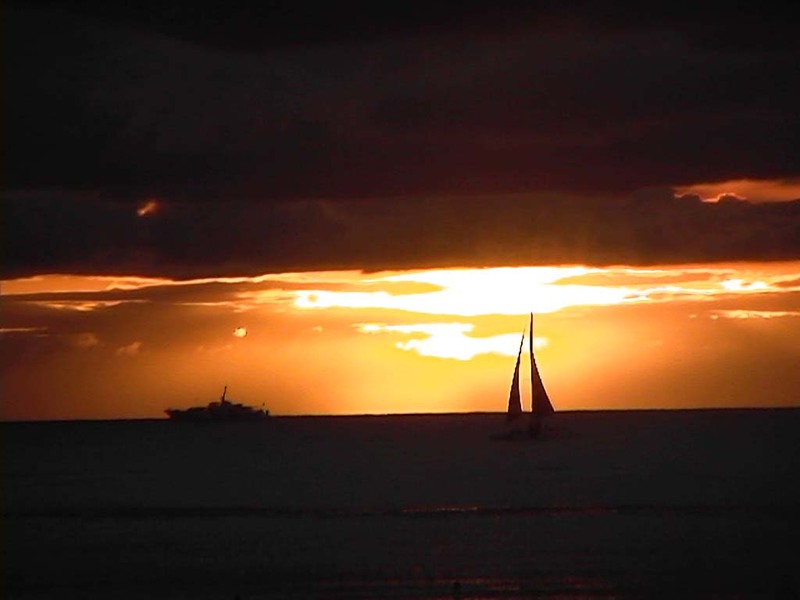 For more information, contact Carol Thomas at 247-3427 or email kaneohecarol@hawaii.rr.com. 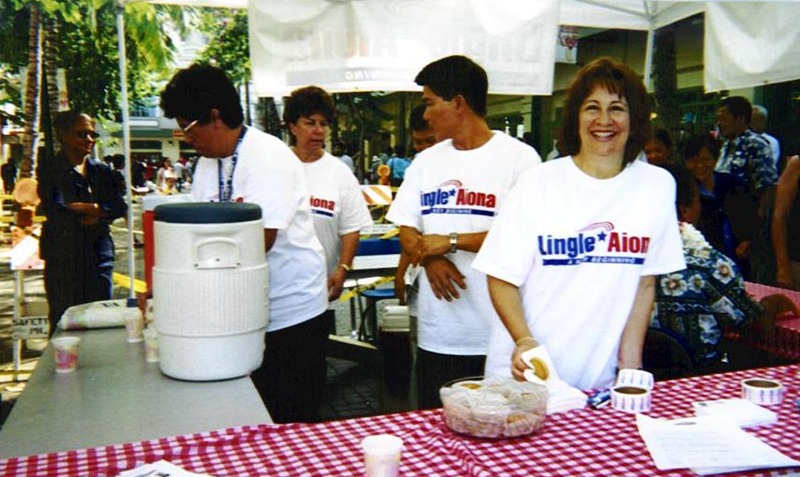 Aug 21 Meet Governor Linda Lingle in person and Republican candidates running for various Federal, State and County Offices at the Kekaulike Mall right in the heart of Chinatown. 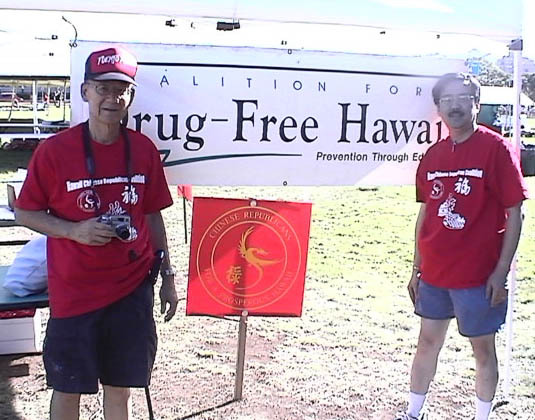 For more information on all of these events, please go to our web page at www.gophawaii.com and click on Upcoming Events for details and contact information. Lt. Governor Aiona conferred with Chen Hui Min, chairman of China Council for the Promotion of International Trade in Pudong. 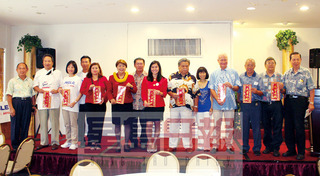 Chen, a member of the Shanghai Political Consultative Committee, hosted a one-on-one business matchmaking luncheon for the Hawai`i delegation. 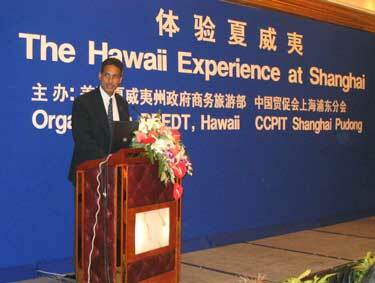 To help promote Hawai`i products and services in emerging Chinese markets, Lt. Governor Aiona joined a state delegation meeting this week with high-level government officials and business executives in Shanghai, Beijing and Tianjin. In addition to conferring with mayors of the three cities, Lt. Governor Aiona is leading a series of discussions with officials for the 2008 Beijing Olympic Games and with ministers of tourism development, environmental protection, and education and training. The Lt. 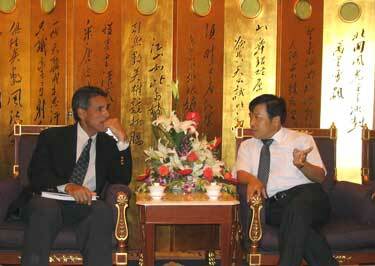 Governor is also meeting with leaders of the China Council for the Promotion of International Trade. 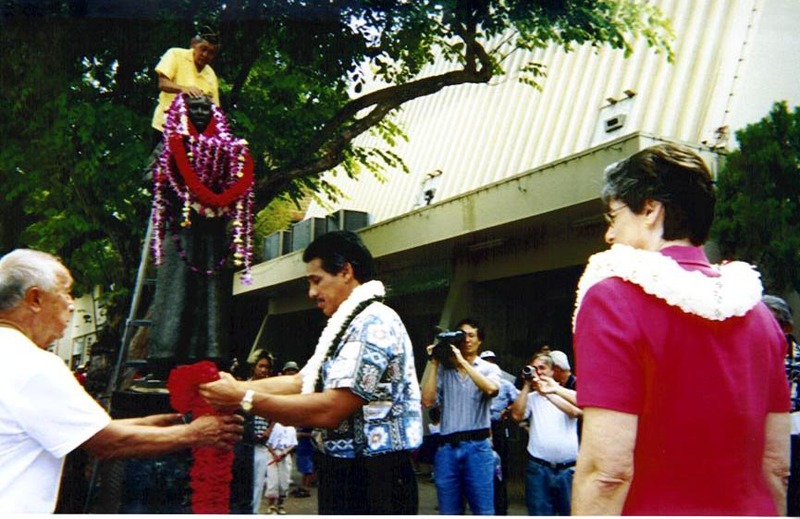 In December 2001, the State of Hawai`i and the council signed a memorandum of understanding to facilitate international economic and business transactions. 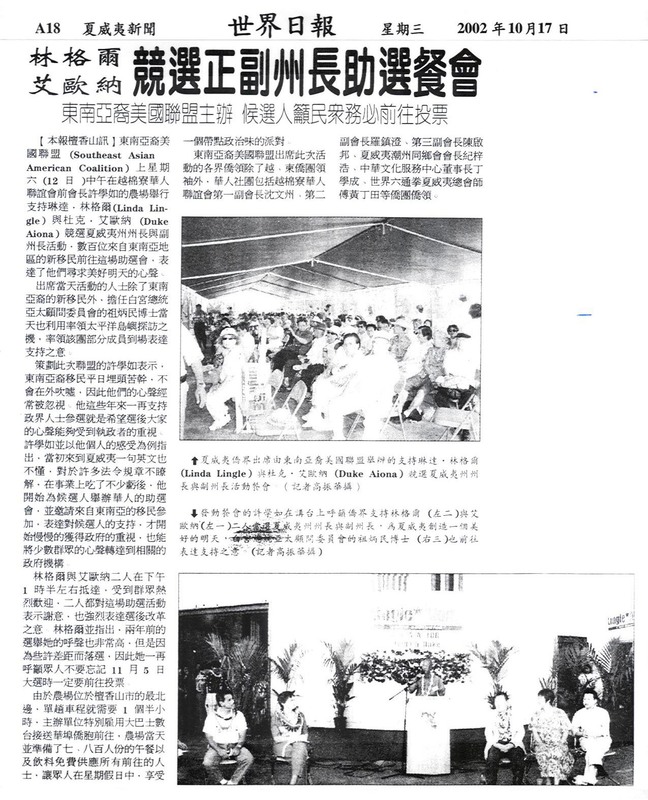 The Lt. Governor’s mission to China coincides with a weeklong exhibit of Hawai`i businesses and entertainers at a new culture, shopping, dining and entertainment center in Shanghai called Xintiandi. During an official eight-day mission to China, Lt. Governor Aiona met with high-level Chinese officials to promote business opportunities and economic development for Hawai`i. 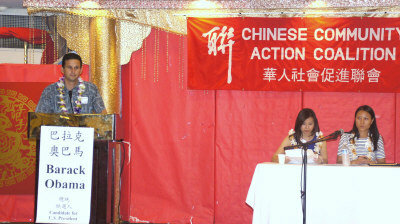 He is shown speaking to the China Council for the Promotion of International Trade. With a membership of over 77,000 companies, the council is the largest institution promoting foreign trade in China. 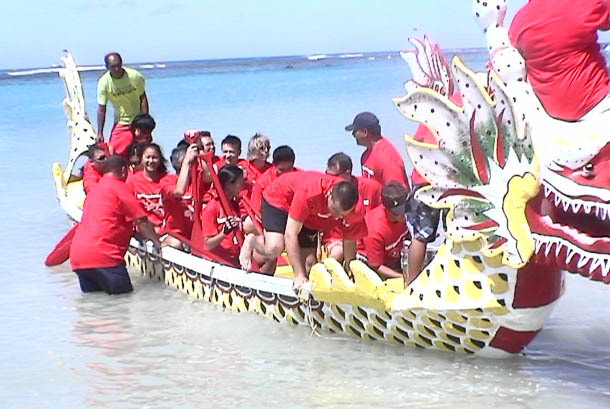 Mr. Herman Hu, President of the Hawaii Chinese Republican Coalition featured at today's Honolulu Advertiser's News Article "Saint Louis Class of 1948 Chipping in"
Dragon Boat Race - Hawaii Chinese Republican Coalition boat was the first to cross the finish line under the Non-profit category! Bob Awana, Chief of Staff of Governor Linda Lingle met with Representatives from District 17 & 18 to discuss various strategies to move Governor Lingle programs and agenda forward. 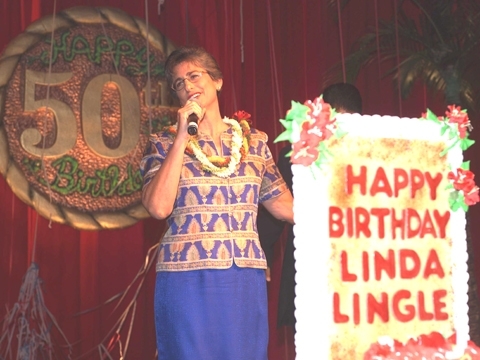 This week Governor Lingle celebrated her 50th birthday with friends from around the state. 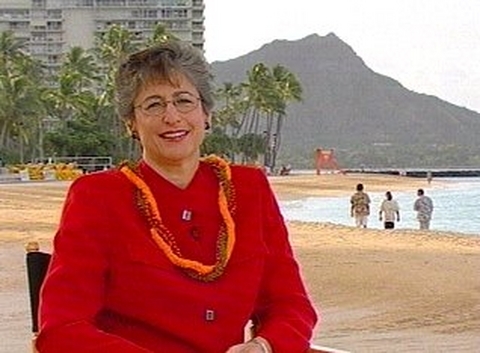 She also took her weekly radio show "on the road" to broadcast live for the first time by any governor in recent memory from a neighbor island. 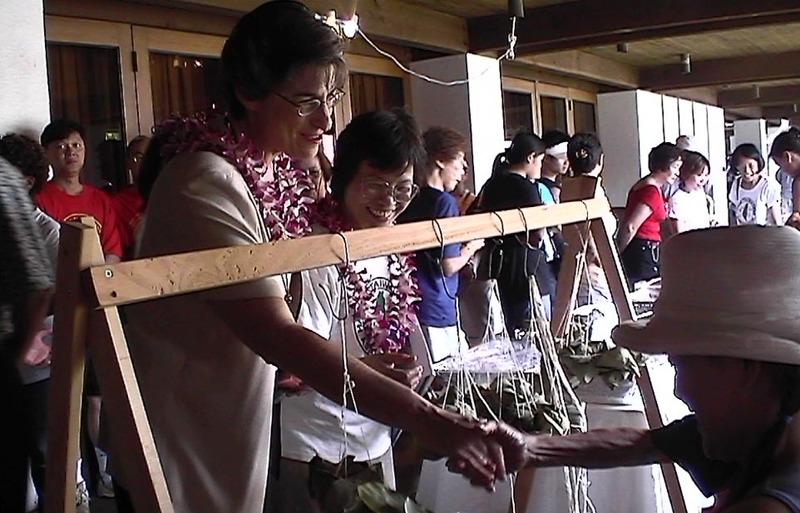 During her visit to Maui, the Governor participated in a ground-breaking ceremony at Waiehu Kou to reiterate her pledge of restoring trust and integrity in government for native Hawaiians. 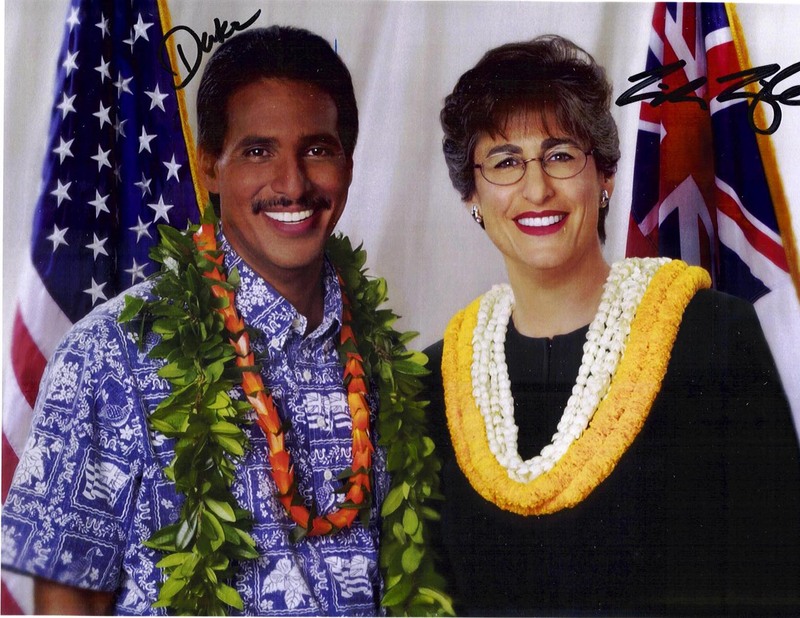 In addition, she appointed the state's first cabinet-level tourism liaison, as well as reaffirmed the administration's goals with the medical community to improve health care for all Hawai`i residents. 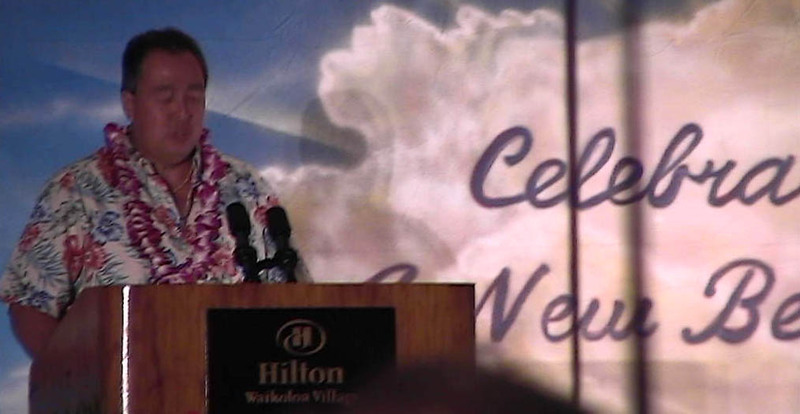 Governor Lingle Shares Lei Day Tradition with the Nation - Governor Lingle marked Hawai`i's annual Lei Day celebration by promoting the state as a visitor and business destination. 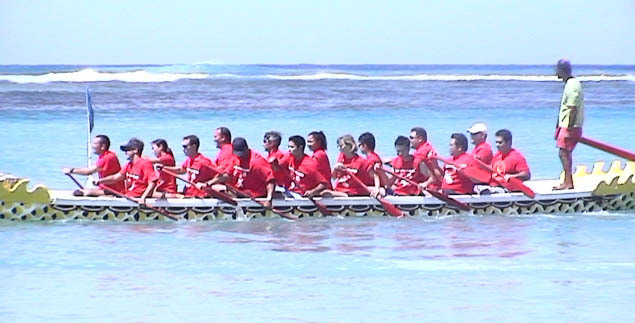 The Governor's interviews with national media, via satellite, originated from Waikiki Beach. 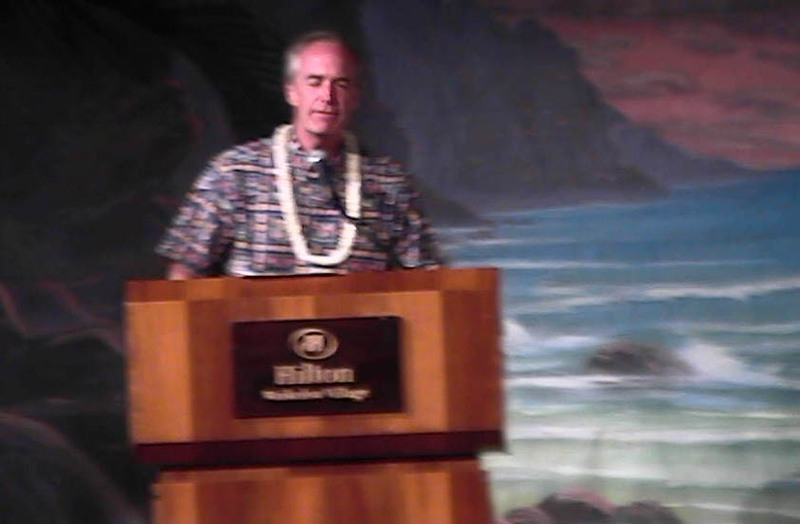 "Not only does Hawai`i have beautiful beaches," said Governor Lingle. "We have the warmest and friendliest people." The Governor's comments were broadcast to a diverse range of news outlets that included the NBC News Channel, Fox News Edge, Daily Buzz, KABC-ABC (Los Angeles), Agriculture Day, KMAX-UPN ("Good Day Sacramento"), and others. 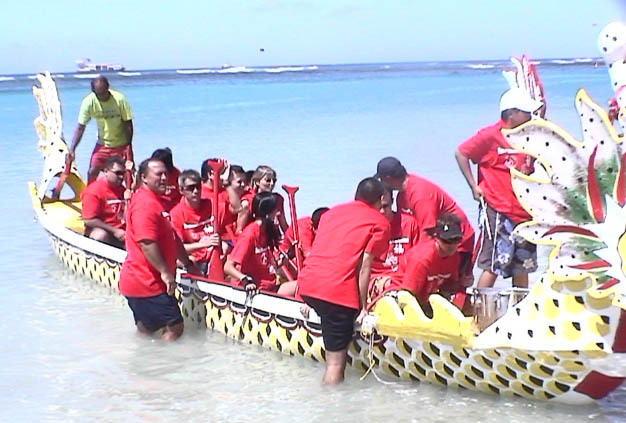 Read more in the Pacific Business News. 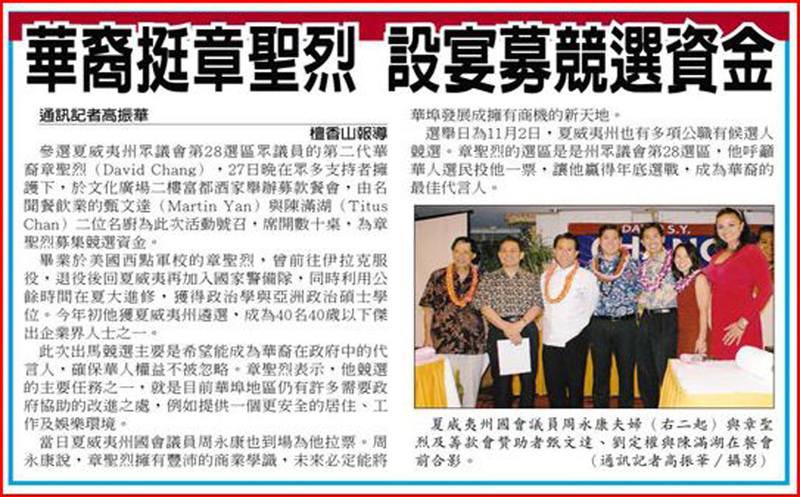 Hawaii: Mr. Duan Qiang, Chairman of the Board of the Beijing Tourism Group (BTG) has signed a Memorandum of University with Mr. Ted Liu, Director of Hawaii DBEDT on collaboration in the areas of training, education and destination management. Following the signing ceremony at Governor Lingle's office, Mr. Duan speaks on “The Beijing Olympics 2008: Challenges and Opportunities for Hawaii Businesses” The Beijing Tourism Group, the largest provider of travel services in Beijing, is the lead tourism service provider for the Olympic Games. 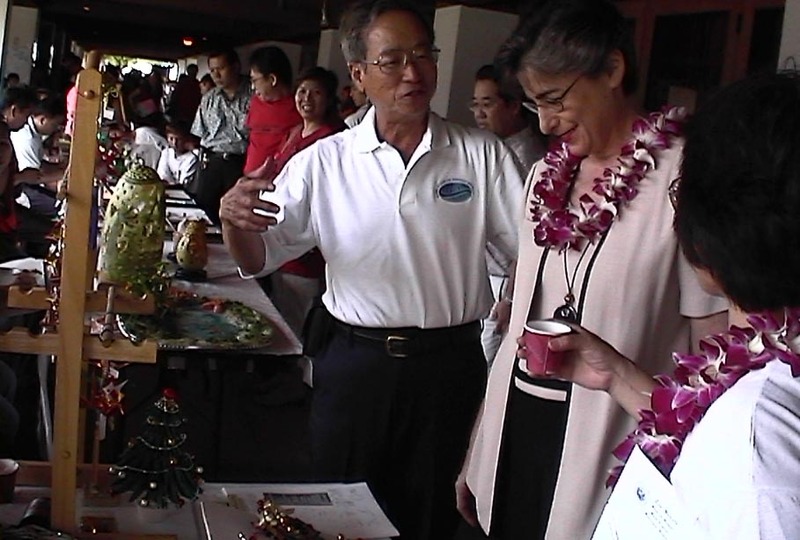 January 11, 2003 - Sustainability Workshop - Sponsored by the City and County of Honolulu and University of Hawaii at the standing room only workshop at the Dole Cannery Ballroom. 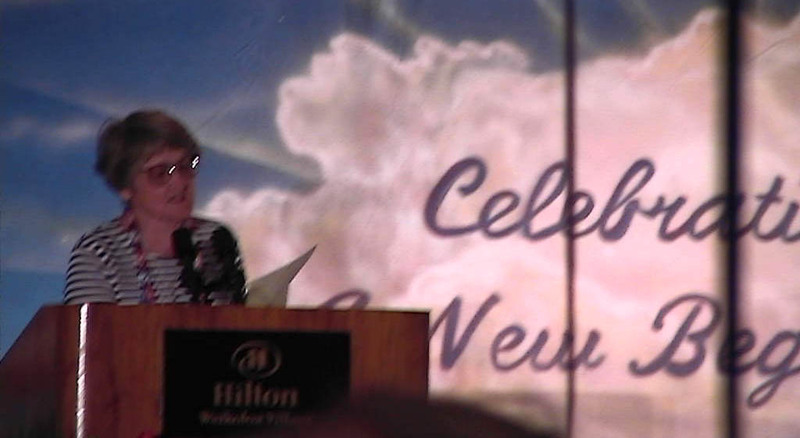 There were more than 1,000 people listen to Governor Linda Lingle, Mayor Jeremy Harris and President Evan Dobelle of the University of Hawaii. 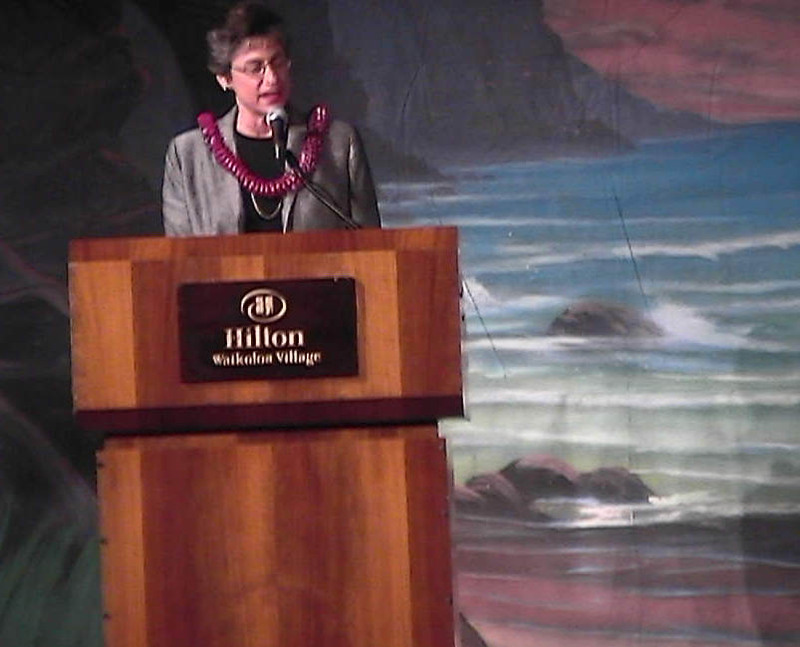 Other presenters include Noel Brown, Former Director of the UN Environment Program; John Bullard, President of Sea Education Association of Massachusetts; Curtis Johnson, President of the Citistates Group; Benjamin Lee, City Managing Director; Hermina Morita, State Representative; Gary Okino, Chairman of the Honolulu City Council and Edwin Orett, Principal of Pacific Technology Association. Designed CRC logo and printed T shirts and campaign signs. Registered over 50 new voters. 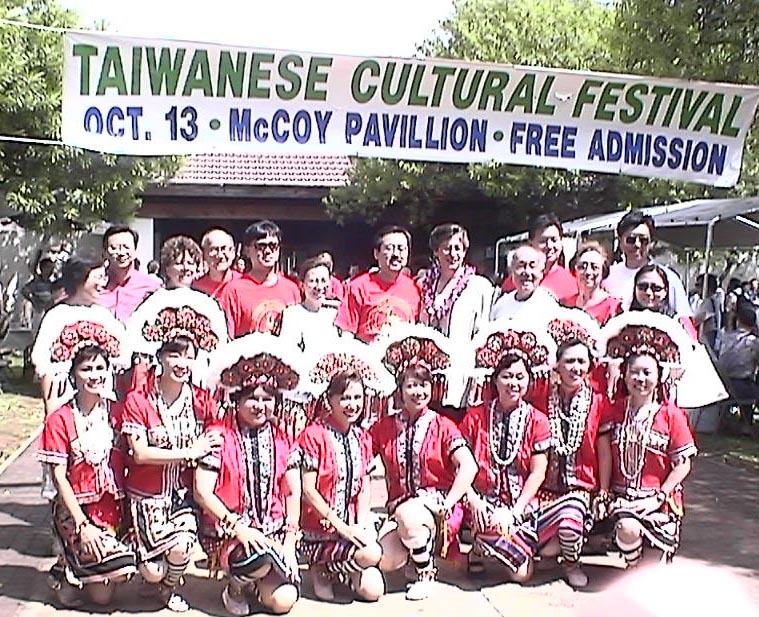 Supported (and led by Johnson Choi) Lingle’s visit to the Taiwan Cultural Exhibit at McCoy Pavilion on Oct. 13. Sign waved and walked for selected candidates whose districts have large Chinese population. 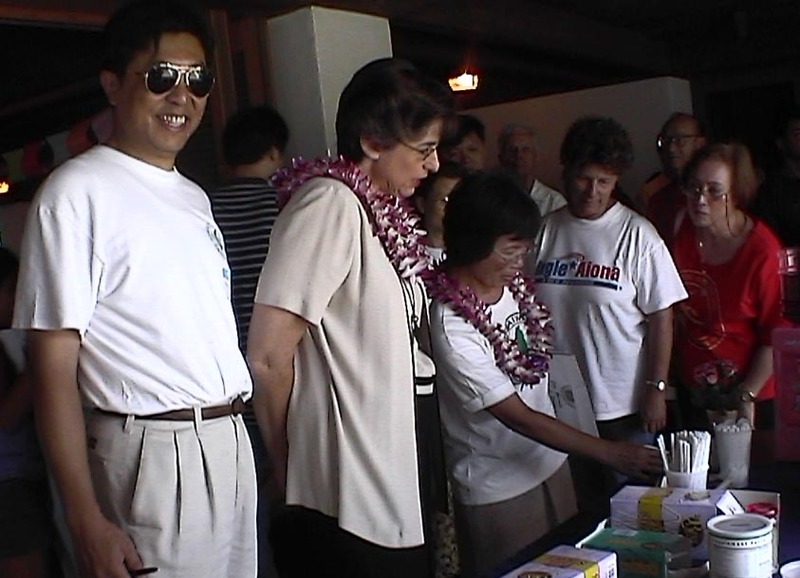 Organized fund raiser for Barbara Marumoto for Congress for Dec. 28. 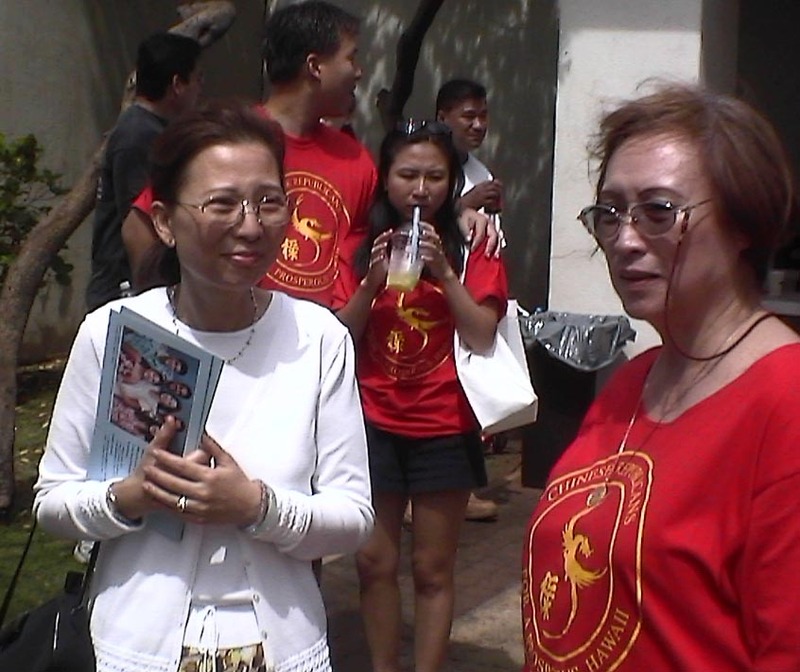 Joined by Rep.’s Bertha Leong and Corrine Ching. Excellent one on one conversation between Reps and members. about our future and the type of leadership Governor Lingle will provide our State. 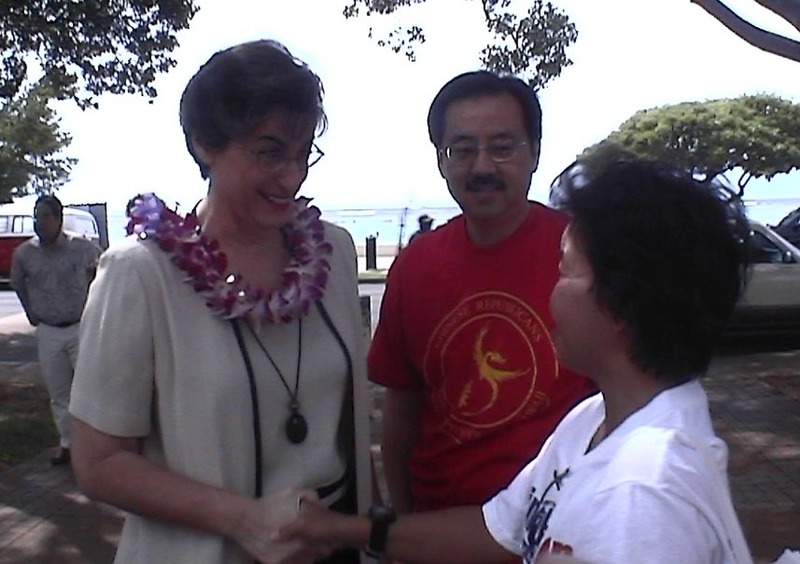 Under Governor Lingle's leadership, we will truly improve life in Hawaii for all kama`aina. I want to take this time to inform all of our members that this past Saturday, I stepped down as Chairman of the Hawaii Republican Party to take on a new challenge in my life as Director of Hawaiian Home Lands. It has been a pleasure and a great honor to serve you as your Executive Director and Chairman. I have learned much from each and everyone of our members and it will be these lessons learned that will continue to help shape me as a person throughout my life. The State Committee voted unanimously to install Dr. Brennon Morioka as the interim Chairman to serve out the remainder of this term. Brennon has also served the Party well as an officer on the State Executive Committee, and more recently, as our Finance Director during this past year. We have all the confidence in Brennon and I ask you to offer him the same type of support that you all have so unselfishly given me over the past four years. I will continue to be vigilant in my efforts to help the Party grow and build upon our current momentum. The Party has the opportunity to play an integral role in the way Hawaii goes about its business and we must now demonstrate the type of leadership that we said we would. I will be notifying the public through various media sources in the coming week about our Party's transition, but wanted to give our Republican Ohana a heads-up before it occurred. 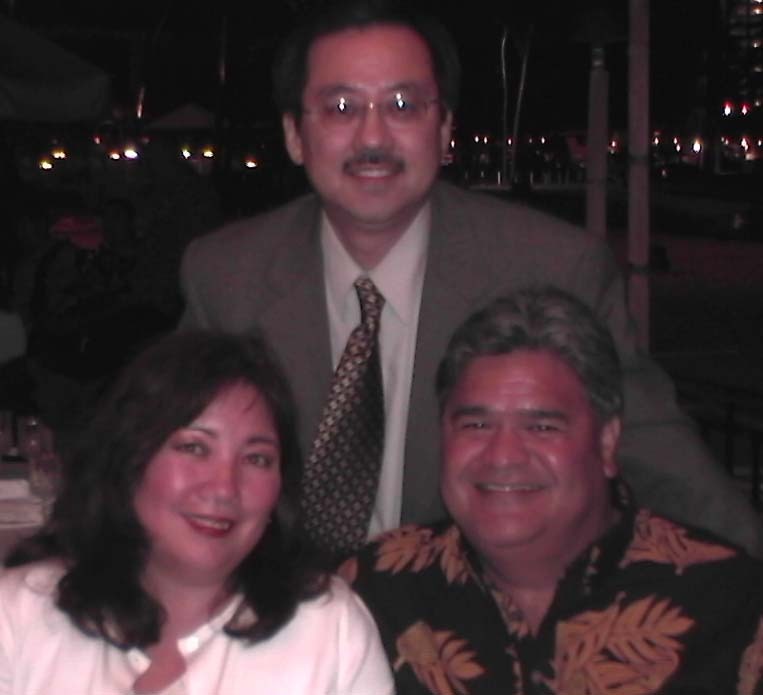 On behalf of my family, I want to thank you for giving me some of the best experiences in my life and allowing me to be a part of Hawaii's political history. 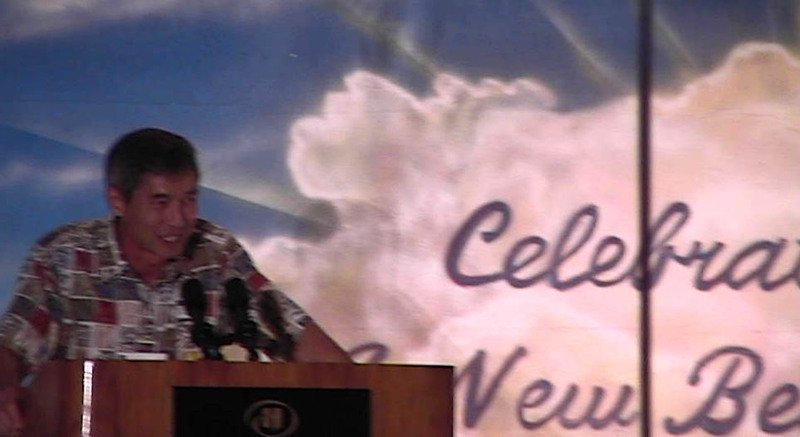 I will always remember my time here as Chairman of the Hawaii Republican Party. Lingle/Aiona beat Democratic opponent with 197,009 votes, or 52 percent, vs. 47 percent, or 179,647 votes, for her Democratic opponent Lt. Gov. Mazie Hirono. 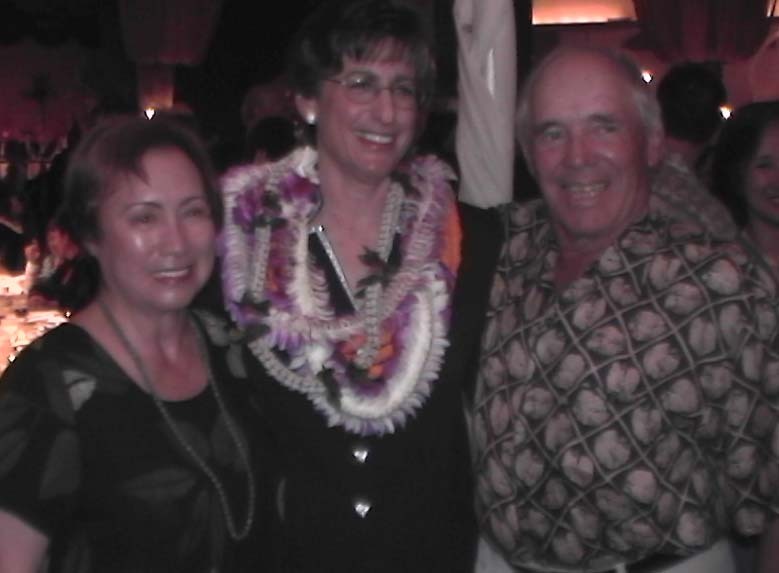 Lingle, the 49-year old former Maui mayor, started running for governor shortly after barely losing to Gov. Ben Cayetano four years ago. 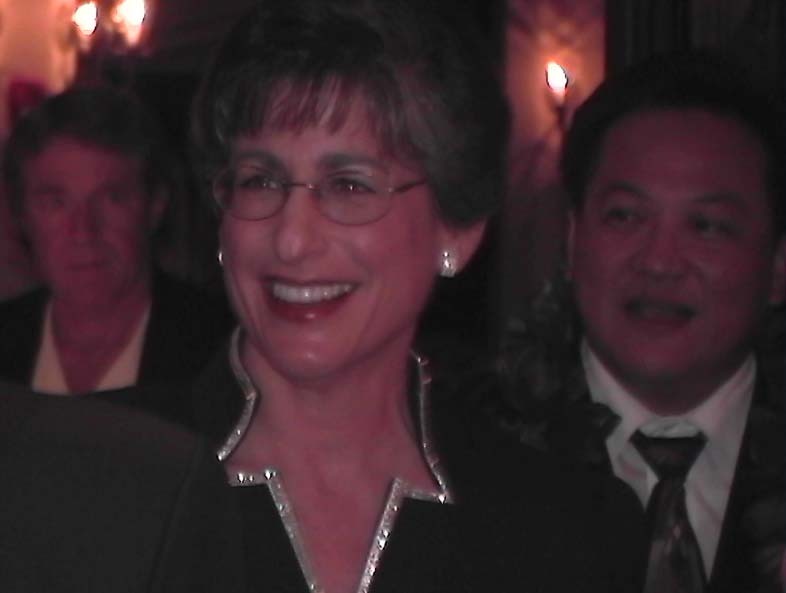 She drove a focused campaign aimed at that stronghold of the Democratic Party, the office of governor. The state’s last Republican governor was William Quinn, who lost the office in 1962. 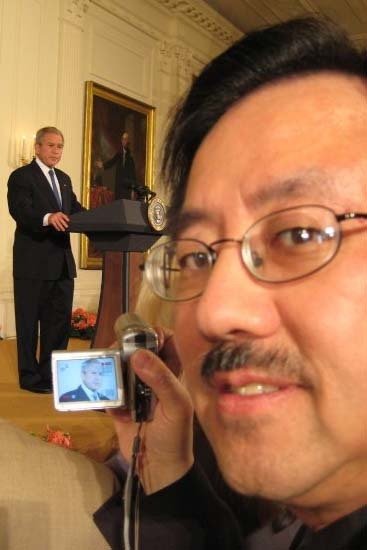 Apparently the picture of Pres. 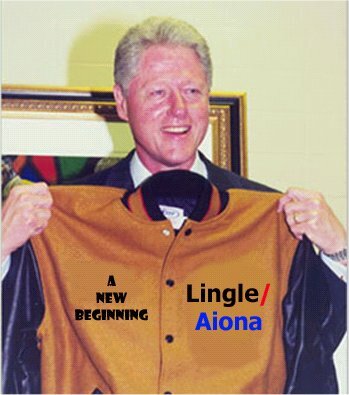 Bill Clinton holding a jacket that read Linda Lingle and Duke Aiona – "A New Beginning" – originated as a joke within the Hawaii Government Employers Association. 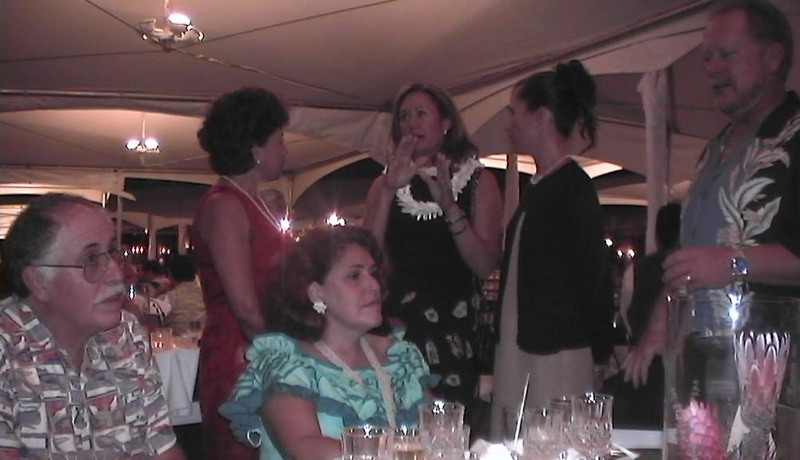 The HGEA was the organizer that flew Clinton to Hawaii at a cost of $100,000 to rally for Lt. Gov. 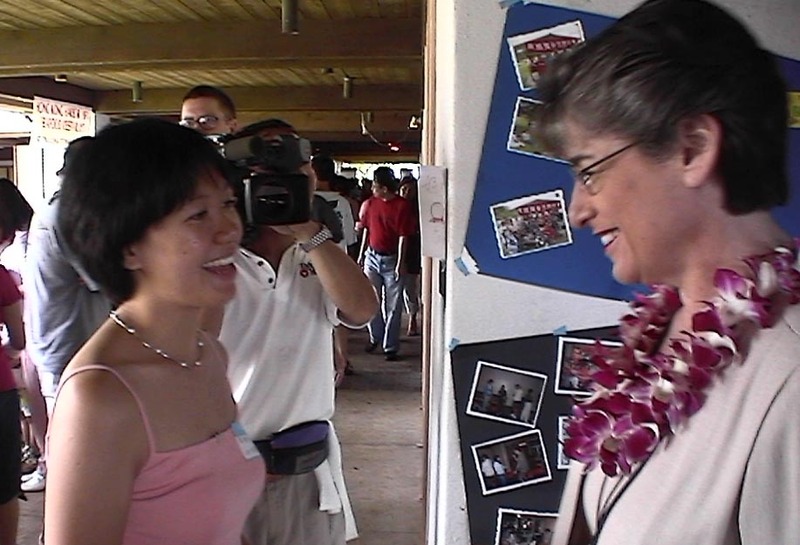 Mazie Hirono and is the organizational force behind Hirono's campaign. But when an employee sent the picture out of the office via email to the Union News Network (UNN writers are supporters of Lingle and Aiona), the picture didn't look so funny anymore –- especially plastered across the cover of the most recent edition of UNN. Sources at UNN say Russell Okada, head of the HGEA, was so mad about the picture that he threatened to sue UNN. UNN reportedly said something back to the effect of "Too bad so sad."